2002-06-06 Assigned to AVIAN COMMUNICATIONS reassignment AVIAN COMMUNICATIONS ASSIGNMENT OF ASSIGNORS INTEREST (SEE DOCUMENT FOR DETAILS). Assignors: ATWOOD, CLIFFORD S., HAMILTON, THOMAS E.
2002-11-15 Assigned to SILICON VALLEY BANK DBA SILICON VALLEY EAST reassignment SILICON VALLEY BANK DBA SILICON VALLEY EAST SECURITY AGREEMENT Assignors: PROQUENT SYSTEMS CORPORATION, F/K/A AVIAN COMMUNICATIONS, INC.
2003-04-01 Assigned to PROQUENT SYSTEMS CORPORATION reassignment PROQUENT SYSTEMS CORPORATION CHANGE OF NAME (SEE DOCUMENT FOR DETAILS). Assignors: AVIAN COMMUNICATIONS, INC.
A method in a network is provided. 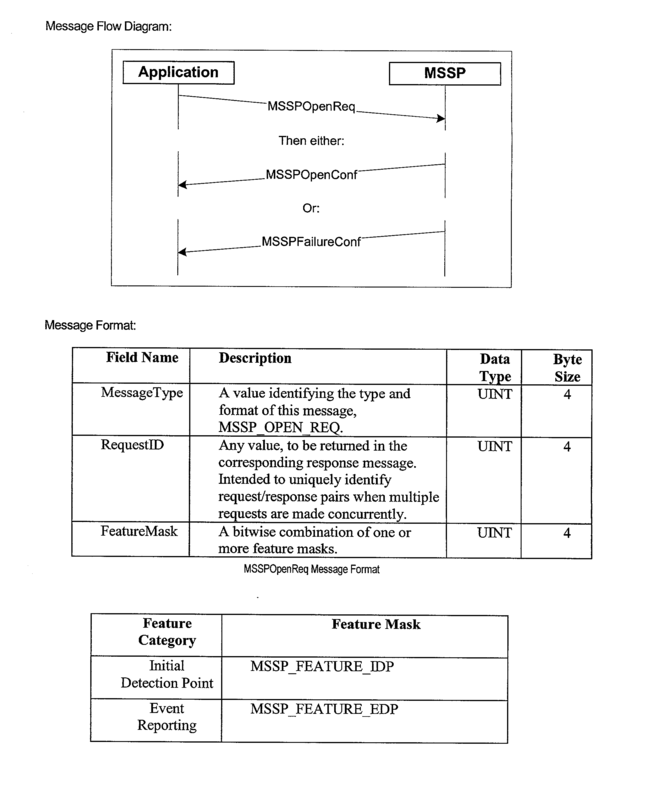 The method includes receiving messages from an application program in an application program interface (API), and passing the messages from the API to a control process in a mobile service switching platform (MSSP). A system is also provided. The system includes a Gateway General Packet Radio Service Support Node (GGSN) linked to control process in a Mobile Service Switching Platform (MSSP), a group of globally connected computers linked to the control process, an application program interface (API) connected to the control process, and an application system executing an application process linked to the API. FIG. 12 shows a table listing sample feature categories. Referring to FIG. 1, a network  10 is shown. The network 10, for example, may be a wireless network. The wireless network may be, for example, a second generation wireless network, a Global System for Mobile Communications (GSM) network, or a General Packet Radio System (GPRS) enabled GSM. The wireless network may be a Time Division Multiple Access (TDMA) network, a Code Division Multiple Access (CDMA) network, or a Universal Mobile Telecommunications System (UMTS) network. The wireless network may be a TETRA network, a Tetrapol network, a DECT network, an AMPS network, a wireless local area network (WLAN) or a third generation wireless network. By way of example, a GPRS enabled GSM network is described. The network  10 includes a Mobile Station (MS) 12 connected to a Base Transceiver Station (BTS) 14. The BTS 14 is connected to a Base Station Controller (BSC) 16. In mobile communications, the MS 12 is a station located within a mobile service intended to be used while in motion or during halts at unspecified points. An example mobile station is a hand held cellular telephone. The BTS  14 holds radio transceivers that define a cell and coordinates radio-link protocols with the MS 12. The BTS 14 is a component of the network 10 from which all signals are sent and received. The BTS 14, often called a cell phone tower, is linked to, and controlled by, a Base Station Controller (BSC) 16. The BSC 16 is a component in the network 10 that manages radio resources for one or more base transceiver stations, such as BTS 14, for example. The BSC  16 is linked to a SGSN 18. The SGSN 18 is a General Packet Radio Service Support (GPRS) Node that serves GPRS mobile by sending or receiving packets via the BSC 16. The SGSN 18 is linked to a Gateway GPRS Support Node (GGSN) 20. The GGSN 20 acts as a gateway between a General Packet Radio Service (GPRS) network and a Packet Switched Public Data Network (PSPDN). The GGSN  20 is linked to a Mobile Service Switching Platform (MSSP) server 22. The MSSP server 22 resides between the GGSN 20 and a globally networked group of computers, such as Internet 24. 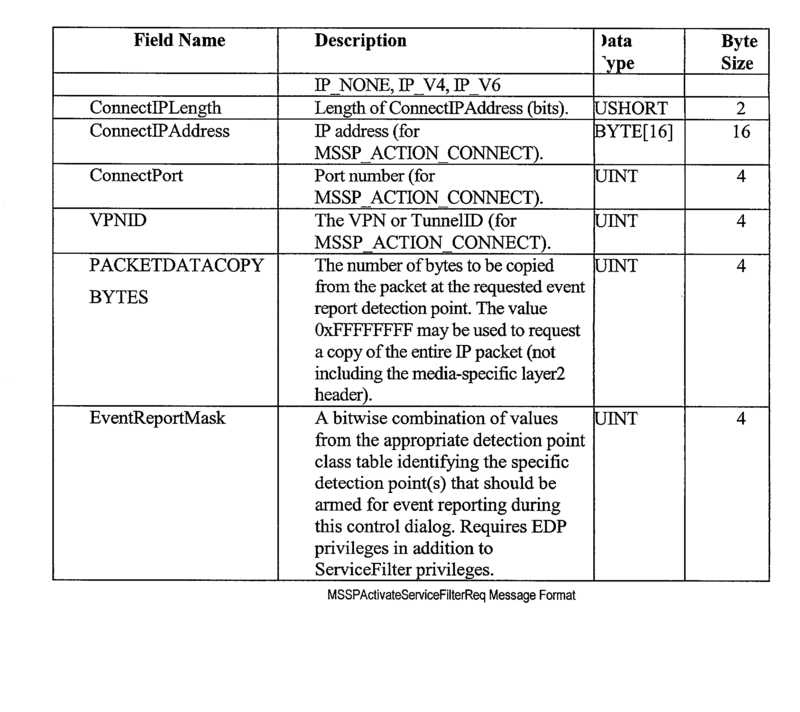 The MSSP server 22 analyzes all of the Internet Protocol (IP) data packets exchanged between the MS 12 and the Internet 24. 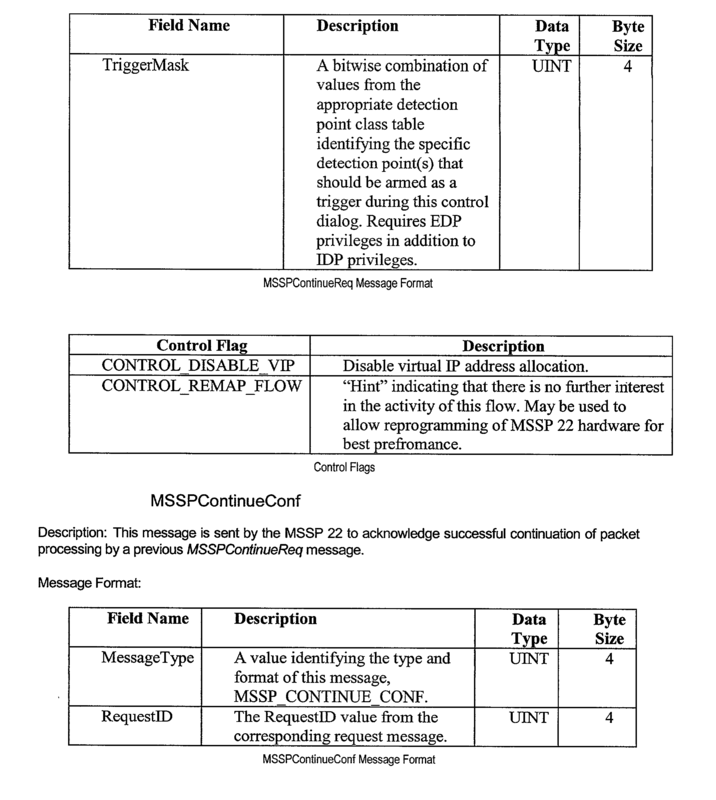 A MSSP control process 26 provides the capability to set triggers or event notifications and increment counters based on IP flow characteristics. An IP flow can be thought of as an abstraction representing a movement of data between two endpoints, such as MS 12 and a server (not shown) residing on the Internet 24. 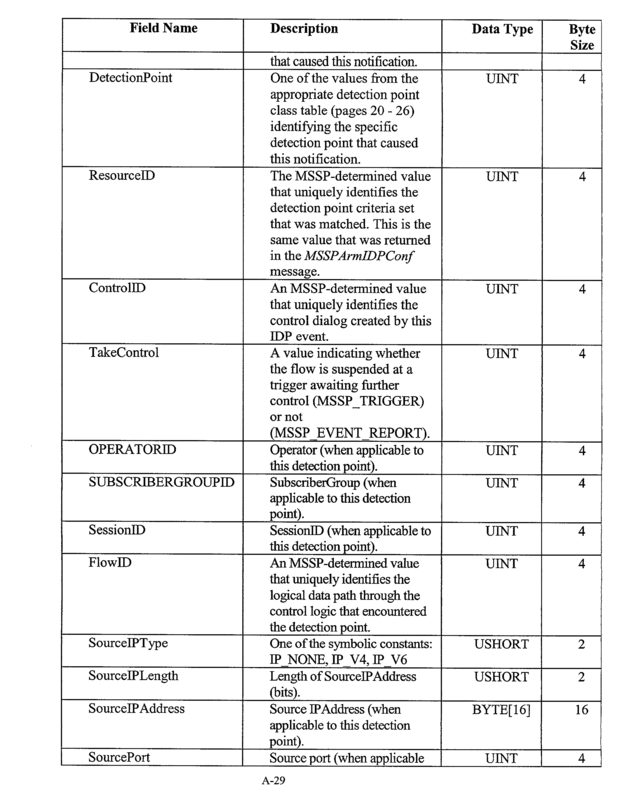 The MSSP control process 26 uses these capabilities to implement internal services and detail reporting. 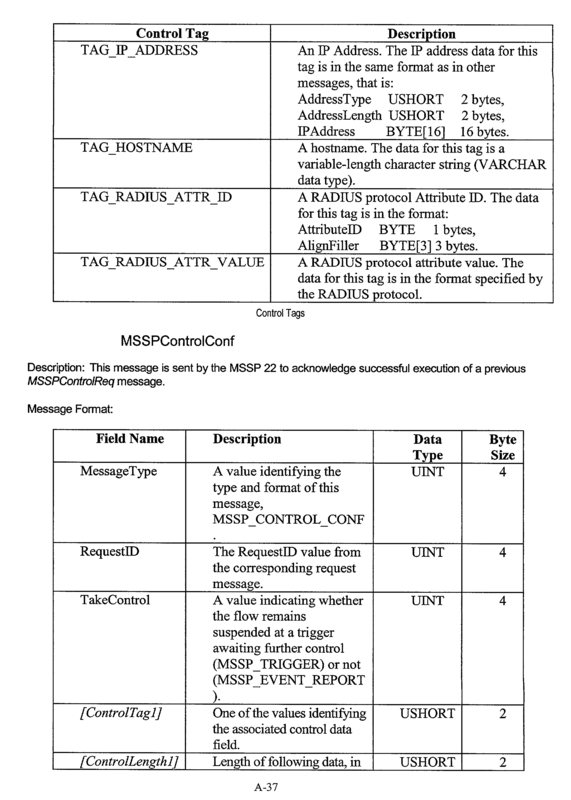 An Application Program Interface (API) 28 links the MSSP control process 26 to external applications 30. The API 28 provides a mechanism for the external applications 30 to control the MSSP control process 26 to provide intelligent services. The API 28, in various embodiments, may be implemented as, for example, a Corba based API, an XML based API, a PARLAY server, an OSA Server, or a JAIN server. Briefly, the MSSP server  22 functions as both an Internet router and an IP packet analyzer. 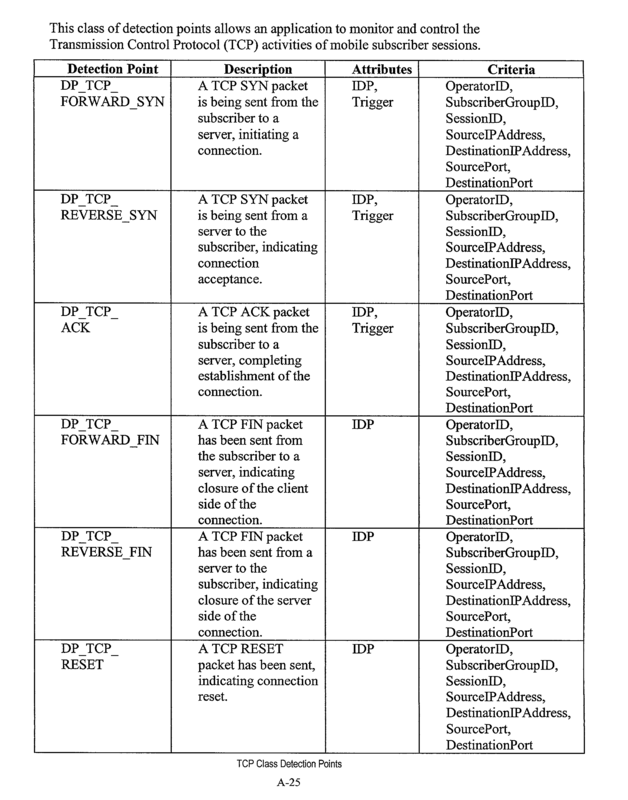 Data contained in a header field of an IP packet is defined in the Internet Engineering Task Force (IETF) RFC 791, incorporated herein by reference (see www.ietf.org). The IETF is a large open international community of network designers, operators, vendors, and researchers concerned with the evolution of the Internet architecture and the smooth operation of the Internet. 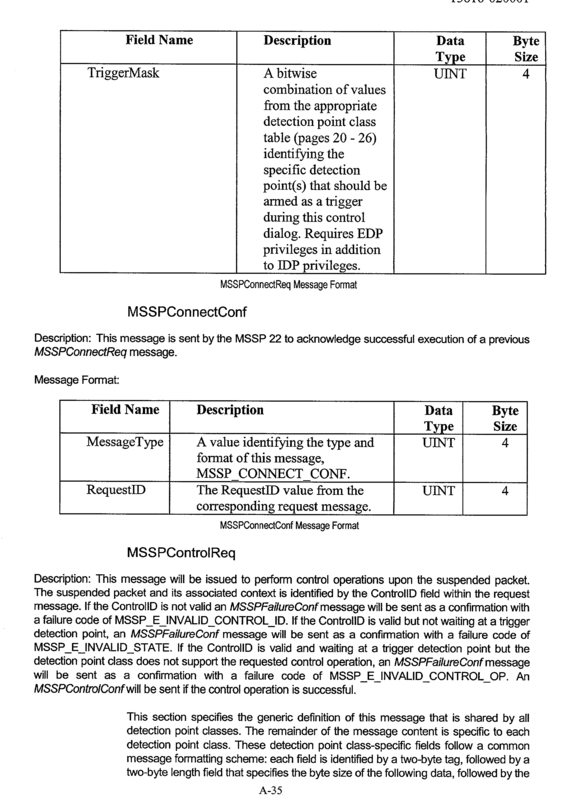 The MS SP control process  26 is designed to analyze 1P packet headers in real time to manage counters and signal when packet characteristics match specified conditions. 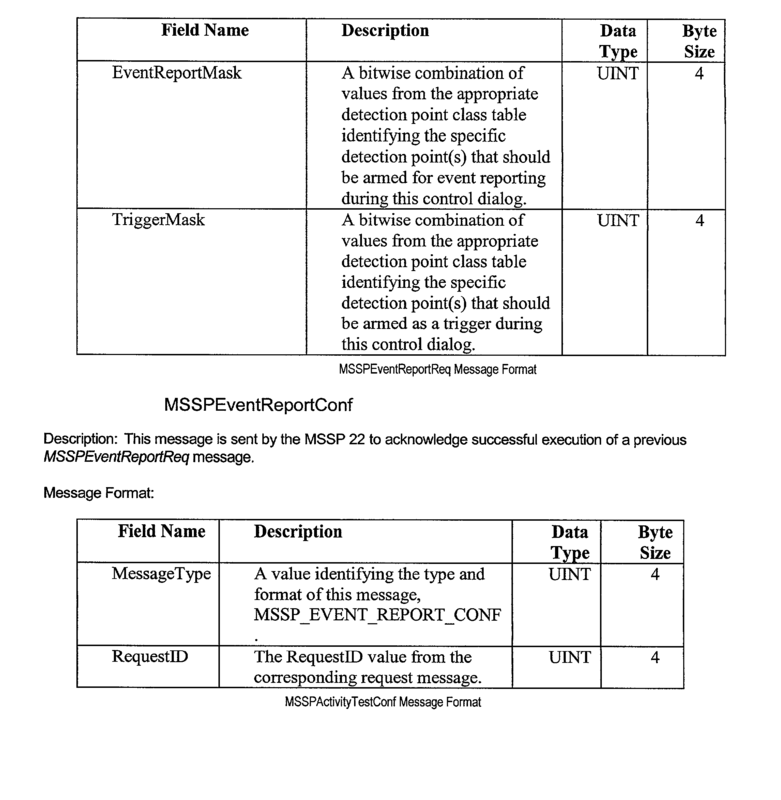 A signal may be an event report or a trigger. 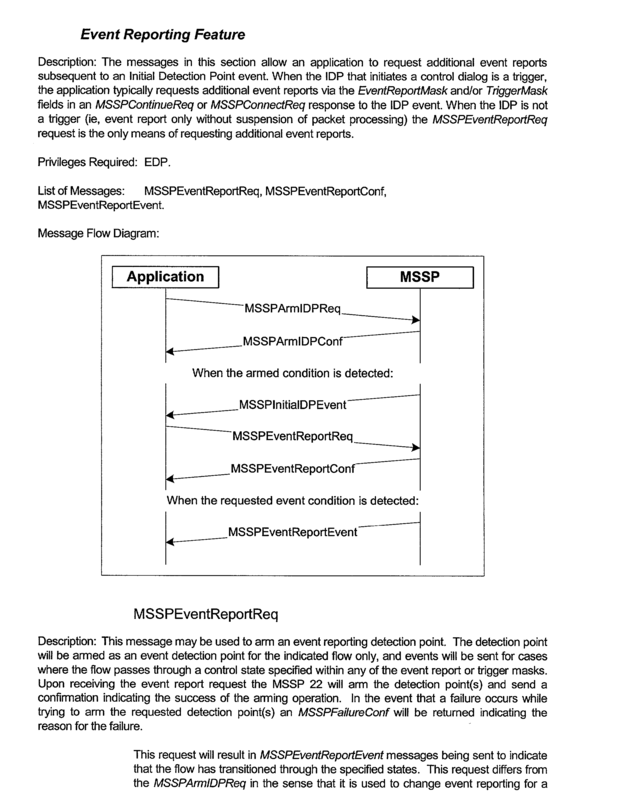 An event report reports an occurrence of some event while continuing to monitor packet flow. 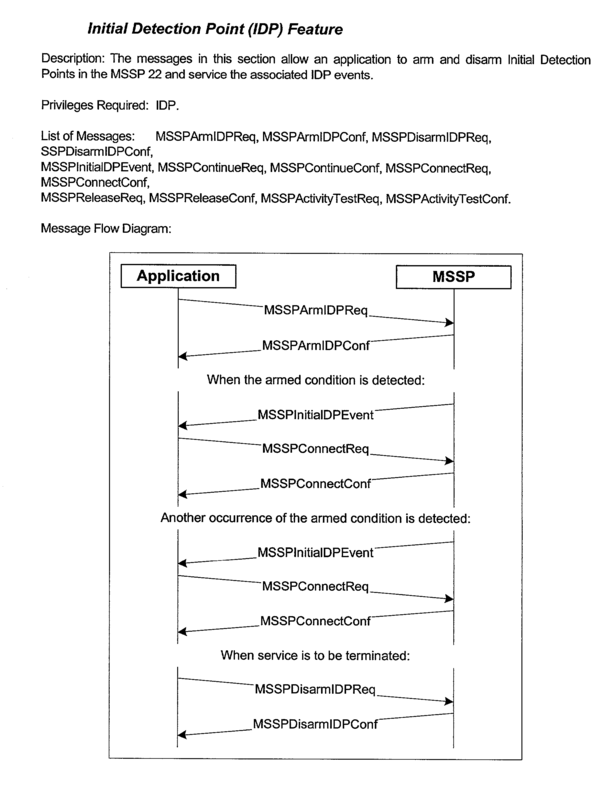 A trigger causes processing of the IP packet to be suspended until the MSSP control process 26 responds with specific instructions for resuming processing of the IP packet. A trigger response may simply direct IP packet processing to be continued unchanged, or it may altar packet processing by specifying a different destination for the packet or cause the packet to be discarded altogether. 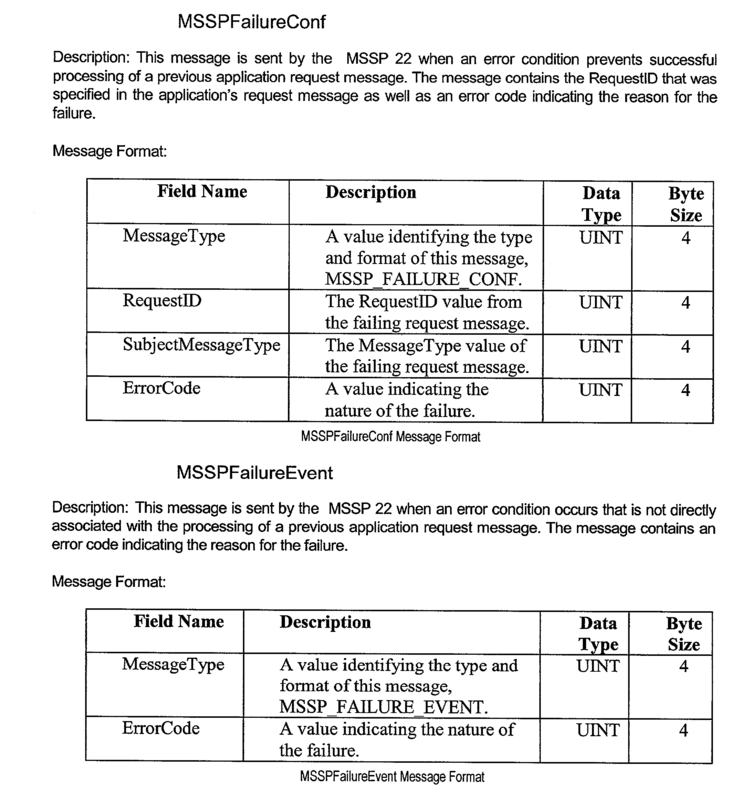 The API 28 provides, in one example, a way for the other applications 30 to communicate with the MSSP control process 26 and manipulate event reports and triggers. 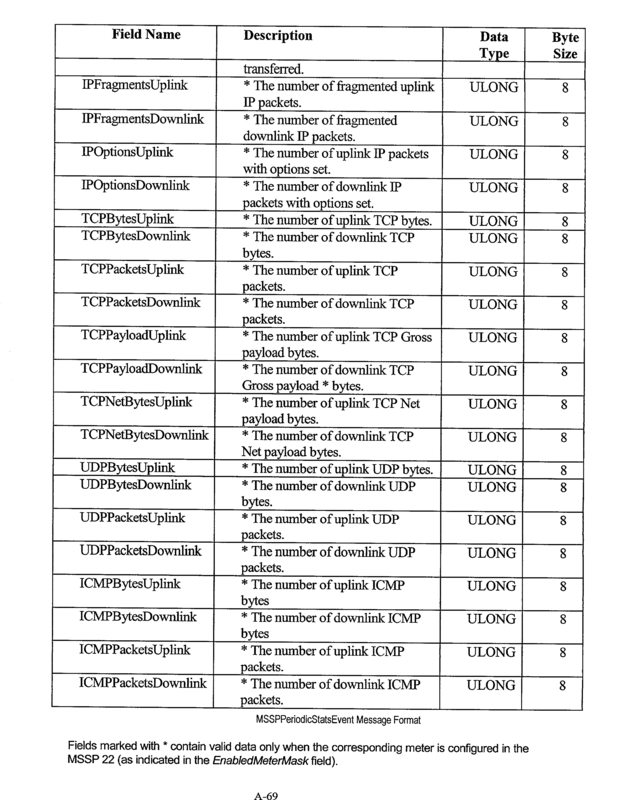 The MSSP control process  26 manages many different types of IP packets. 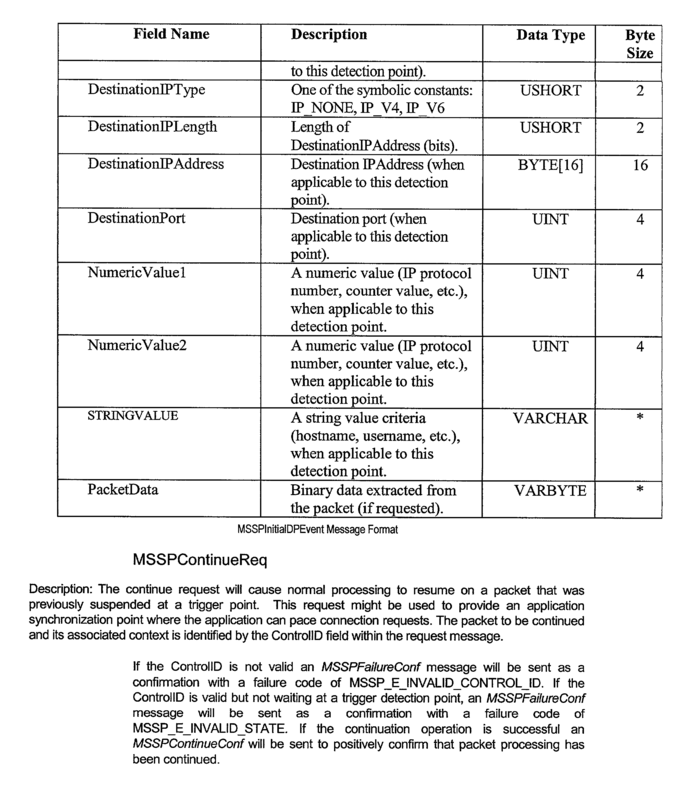 In one example, the MSSP control process 26 is divided into different state machines (not shown), each state machine responsible for different types of packets. In general, a state machine is any device that stores the status of something at a given time and can operate on input to change the status and/or cause an action or output to take place for any given change. In practice, state machines are used to develop and describe specific device or program interactions. Within each state machine of the MSSP control process  26 there are strategic places where important information becomes available or key decisions are made. These places are called detection points. 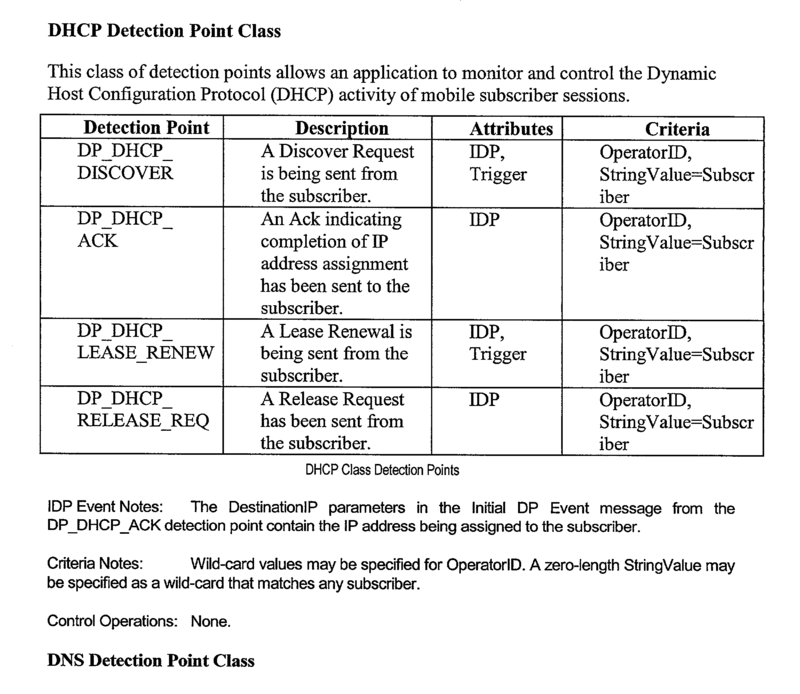 A detection point (DP) is a defined place in a state machine of a control entity where application event reporting and/or control are possible, and manageable through the API 28. Packets pass through the MSSP control process  26 in the MSSP server 22 on their way between a client, e.g., MS 12, and a server (not shown) residing on the Internet 24. 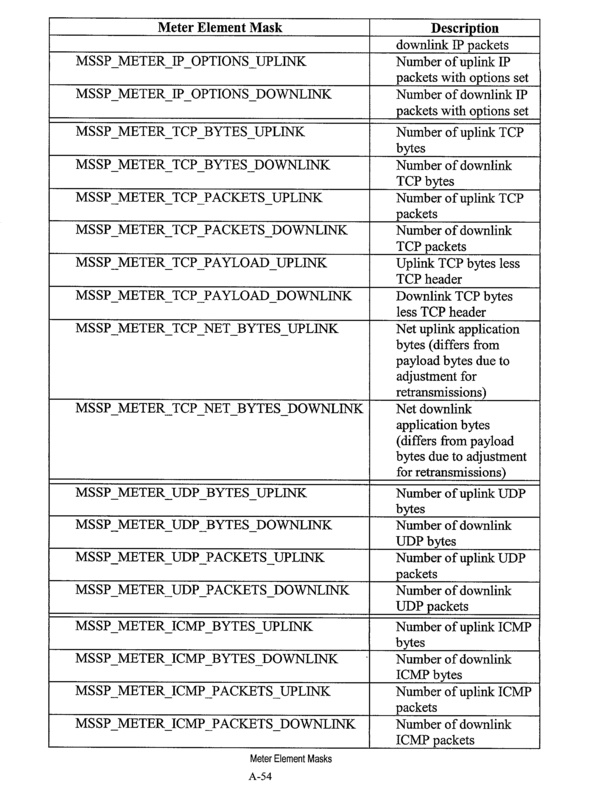 By examining the IP header of the packets, the MSSP control process 26 determines that the IP packet encapsulates TCP data and assigns the packet to TCP control logic. 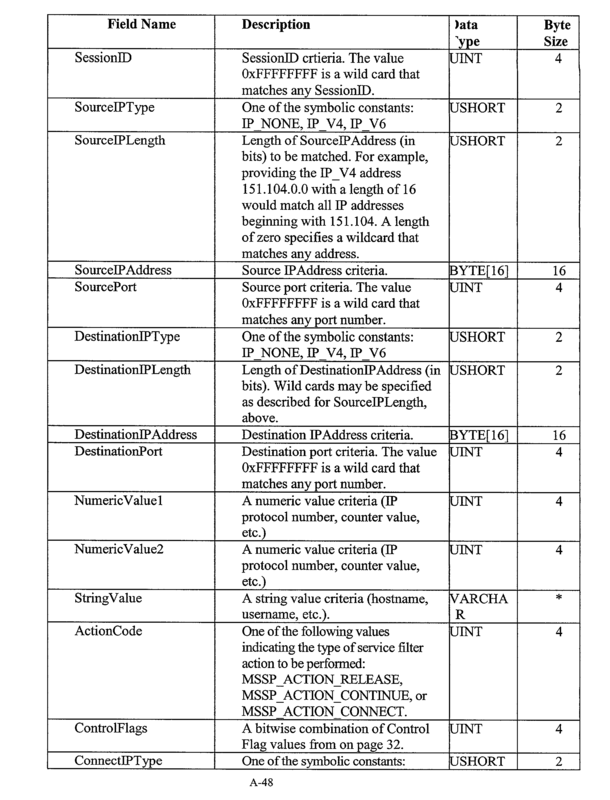 By examining the data in the TCP header in conjunction with the data in the IP header, the TCP control logic can distinguish each segment of the connection establishment. 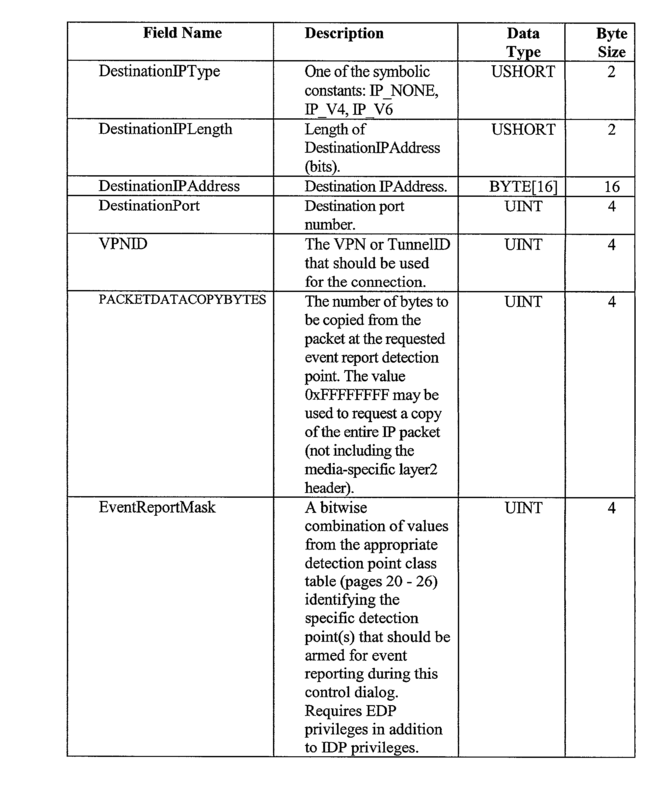 For example, suppose that one of the service applications  30 would like to “intercept” TCP connections to a specific server on the Internet 24 and redirect them to different servers on the Internet 24, perhaps based on the service application's knowledge of current server load conditions. 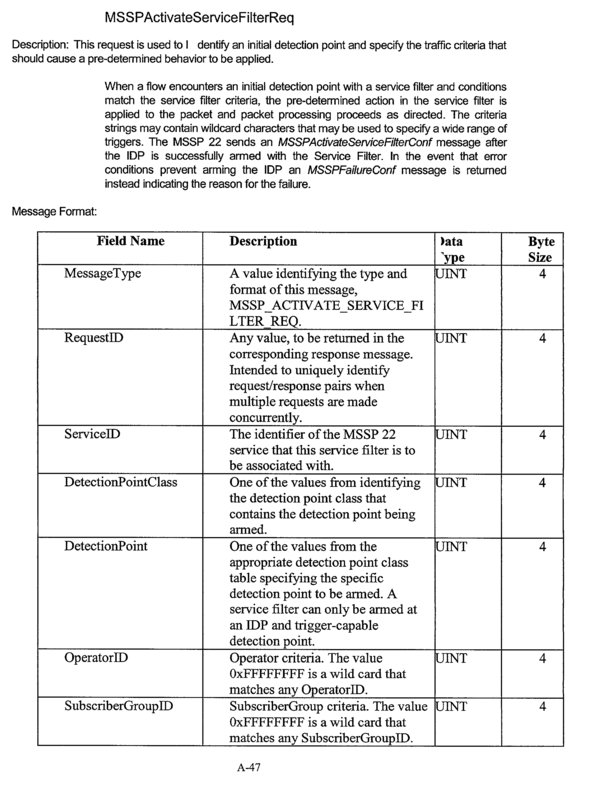 The service application 30 can instruct the MSSP control process 26 through the API 28 to generate a trigger that watches for a TCP SYN packet that has a destination that matches the server to be intercepted. This is referred to as an Initial Detection Point (IDP). 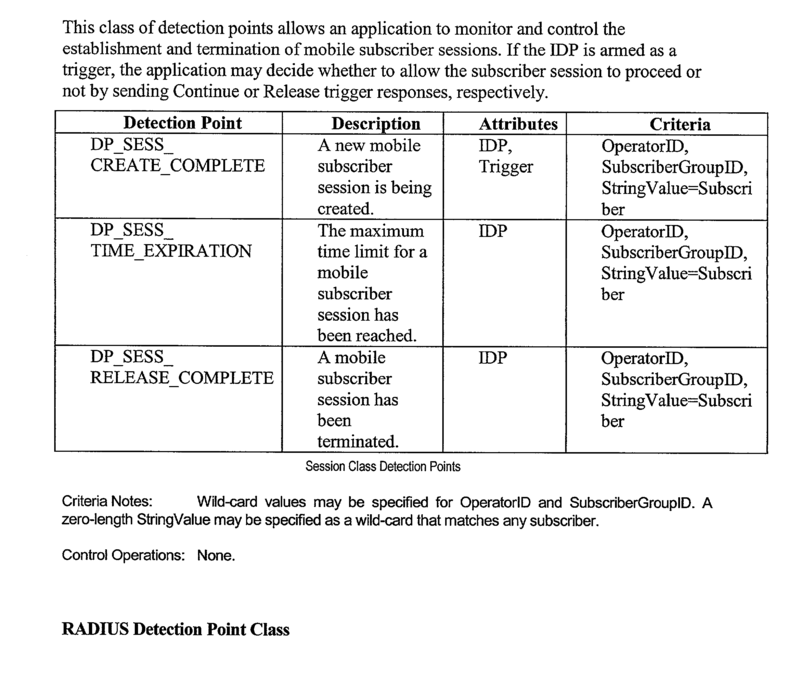 An IDP is a detection point armed so as to generate a new control dialog with an application when conditions match given criteria. All other TCP packets, and TCP SYN packets directed to a different destination, continue to be processed normally. 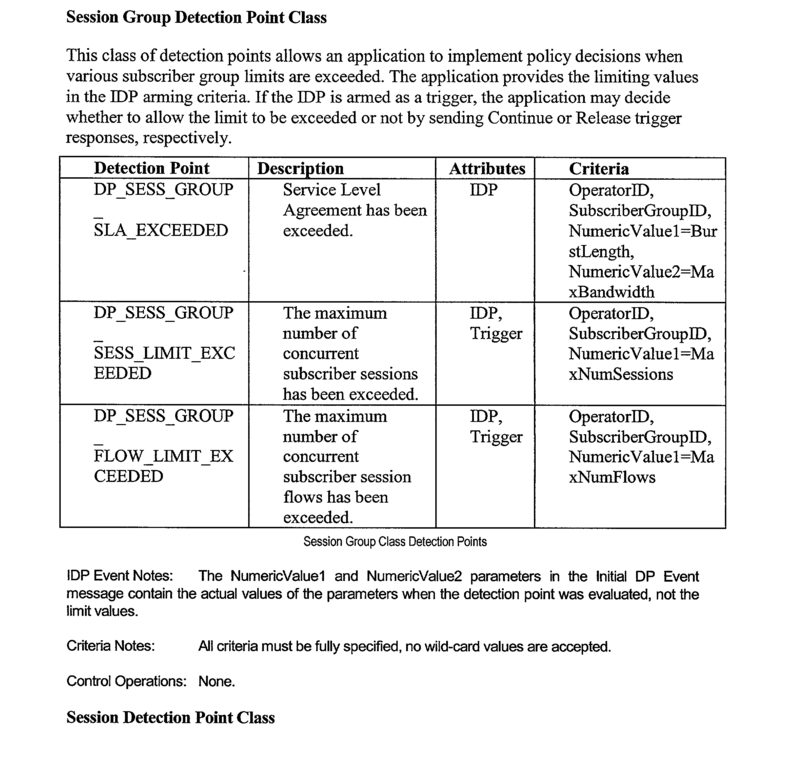 A TCP SYN packet with a destination that matches the arming criteria, however, causes processing of that packet to be suspended and an IDP event notification sent to the service application  30 that armed the IDP through the API 28. 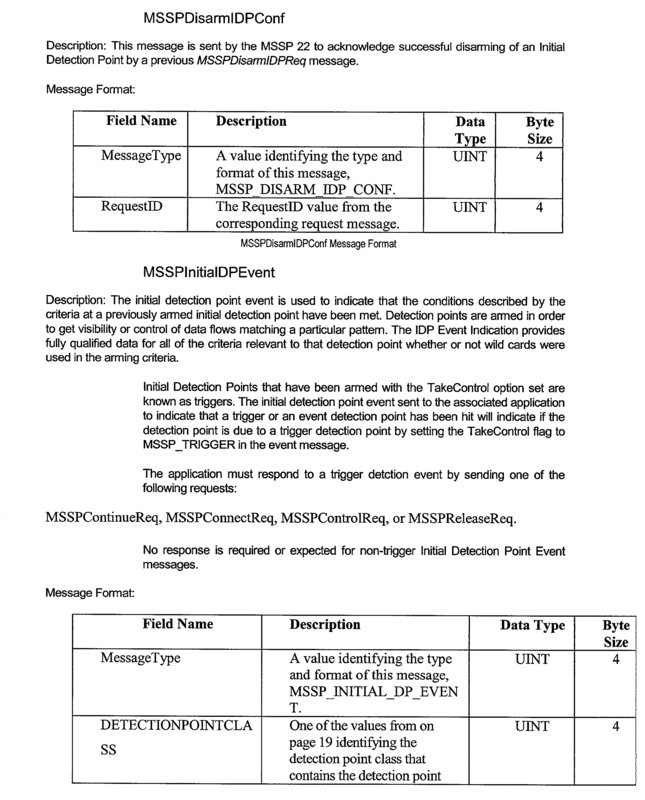 The IDP event notification may include, for example, information from the suspended packet that the service application  30 may use to determine a correct destination for the connection. 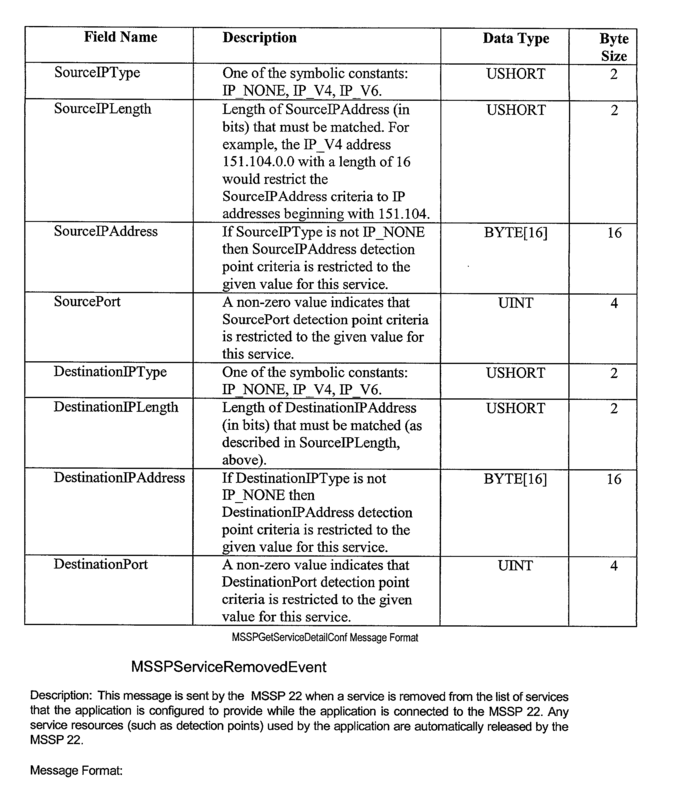 The service application 30 then directs the MSSP control process 26 through the API 28 to resume packet processing with a different destination address. The MSSP control process 26 forwards a modified TCP SYN packet to the new destination, where that server responds in a typical manner. The service application's involvement is completely transparent, i.e., neither the client, e.g., MS 12, nor the server (not shown) on the Internet 24 is aware that any redirection has taken place. 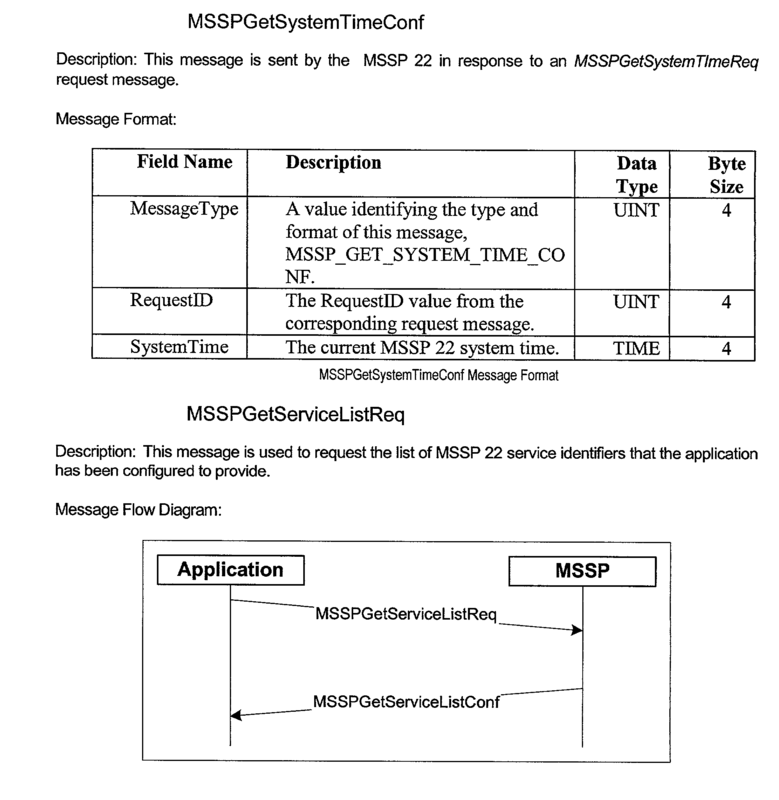 Service applications  30 interact with the MSSP control process 26 by exchanging TCP/IP messages. The API 28 listens for connections from service applications 30. 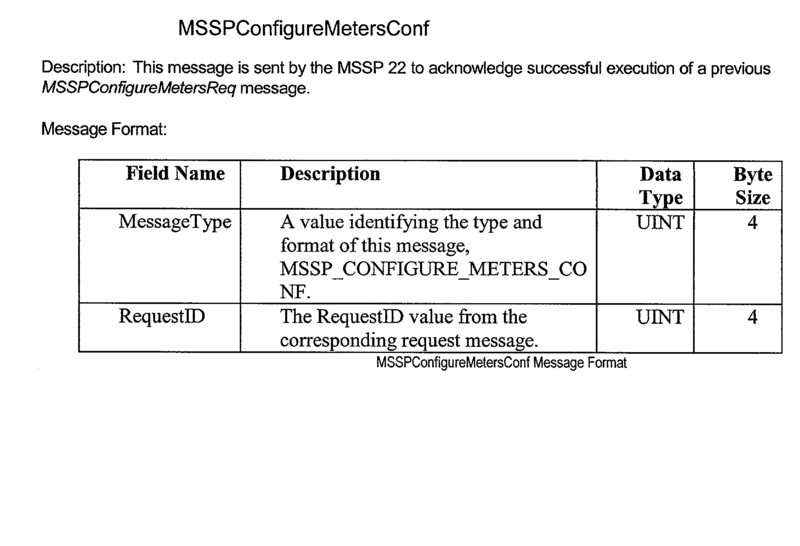 When an application connection is made, the API 28 authenticates the identity of the connected service application 30 and looks up the features that the application is authorized to access. 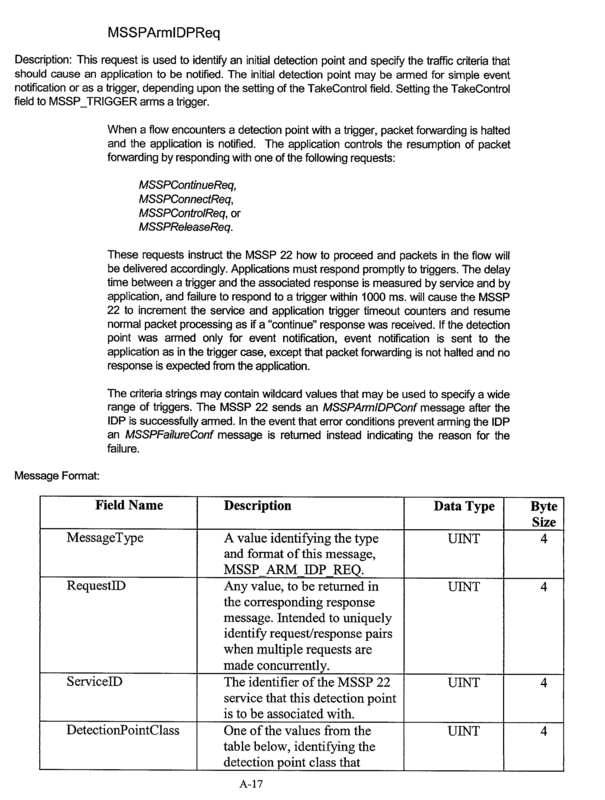 The service application  30, once its communication session with the API 28 is established, requests a list of services that it is expected to provide from the MSSP control process 26 and then arms Initial Detection Points needed to implement those services. After that, the service application 30 waits for the MSSP control process 26 to signal when it has a packet that matches the arming criteria. When the MSSP control process  26 signals an IDP event, the service application 30 applies its service logic (not shown) through the API 28. 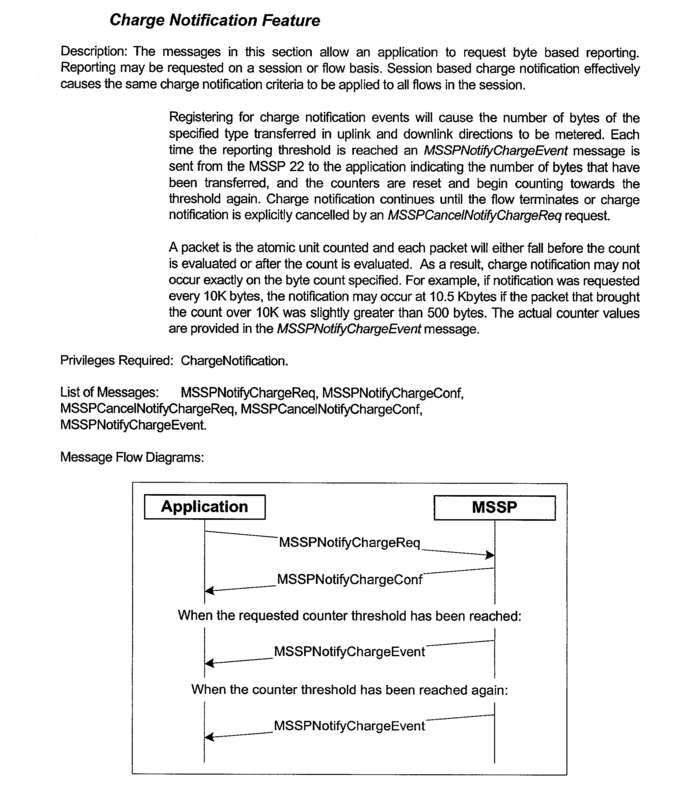 This service logic may, in addition to directing the packet to a chosen destination, configure additional metering for the packet flow that encountered the detection point, request additional event reports from this flow, indicate a charge plan that is applicable to the flow, request periodic charge notification events, or request flow statistics. 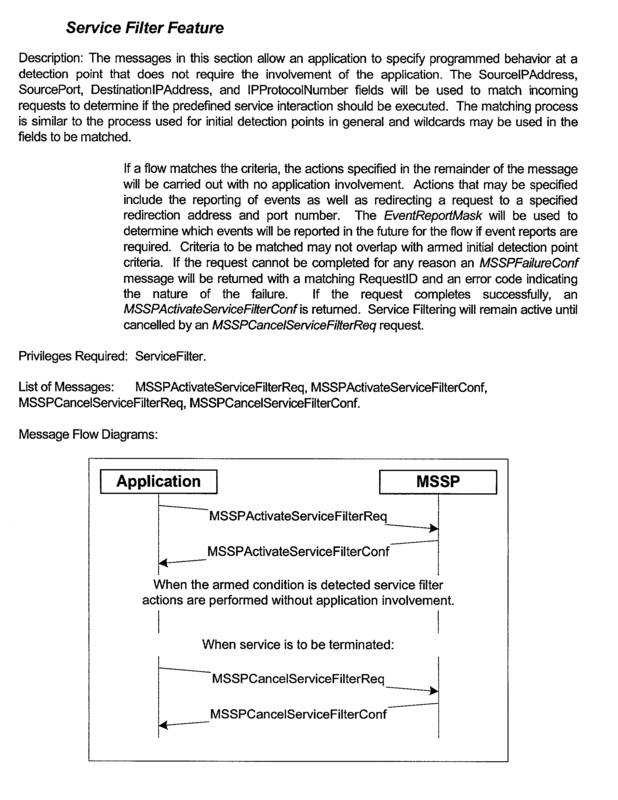 In an example, using an activate service filtering request message of the API  28, a default behavior of a service interaction between the MSSP control process 26 and the service logic of the application 30 may be specified without the need to implemenet a trigger detection point. A source address, source port, destination address string within a data portion of a packet and protocol port are used to match incoming requests to determine if a predefined service interaction should be executed. If a flow matches the criteria, the actions specified in the remainder of the message are carried out. Example actions that may be specified include the reporting of events as well as redirecting a request to a specified redirection address and port number. 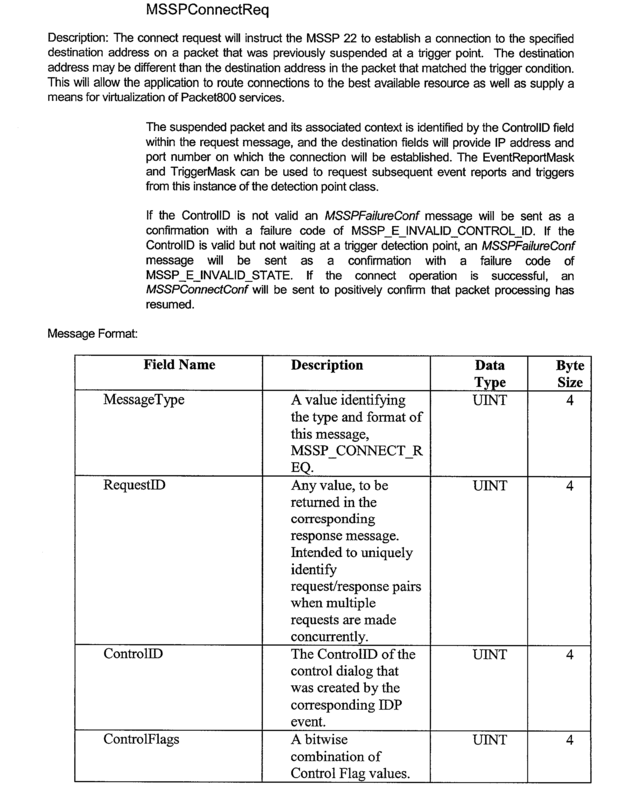 For example, the API  28 provides a connect request message that instructs the MSSP control process 26 to establish a connection to a specified destination address on a flow that is suspended at a trigger point. The destination address may be different than the desitination address in the packet that matched the trigger condition. This allows the service logic in the service application 30 to, for example, route connections to a best available resource. 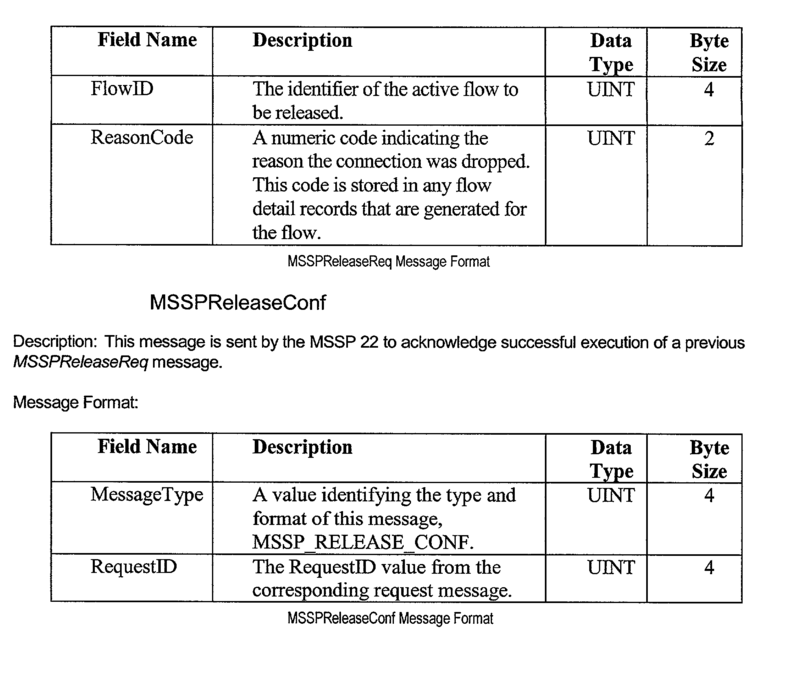 The API  28 provides a release flow message that instructs the MSSP control process 26 to terminate an active flow. The MSSP control process 26 will terminate the flow and may provide any events or metering messages following confirmation of the termination. Thus, using the API  28, the service application 30 manages and controls sponsored packet switched data services, which include any and all unique network addresses that identify the packet switched data service, the policy decisions that determine how, and to which, packet switched data service provider the user is directed (e.g., a specific server on the Internet 24), and the policy decisions that determine which sponsor is to be billed for the session and on what basis. Policy filters may be used to block IP traffic in either direction based on port, protocol, IP address, cookies, or other layer seven protocol characteristics. The policy filters also allow the service logic to create and manage a wall garden or subscription based model. The policy filters are dynamic in nature, allowing new services to be purchased dynamically and updated by the service logic. Referring to FIG. 2, using TCP as an example, an interception process  50 includes a service application startup stage 52, a service initialization stage 54, a service deployment stage 56, a service logic stage 58 and a shutdown stage 60. Referring to FIG. 3, the service application startup stage  52 includes initializing (70) a transport layer. The transport layer is initialized (70) by creating a TCP/IP socket and connecting the socket through the API 28. The stage 52 initializes (72) a session layer. 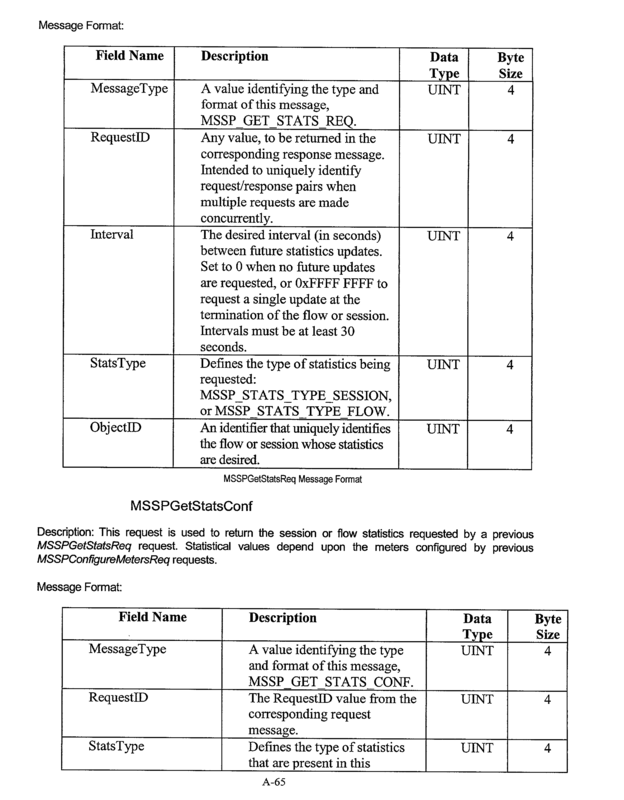 The initialization (72) includes sending a session open request to the MSSP server 22. 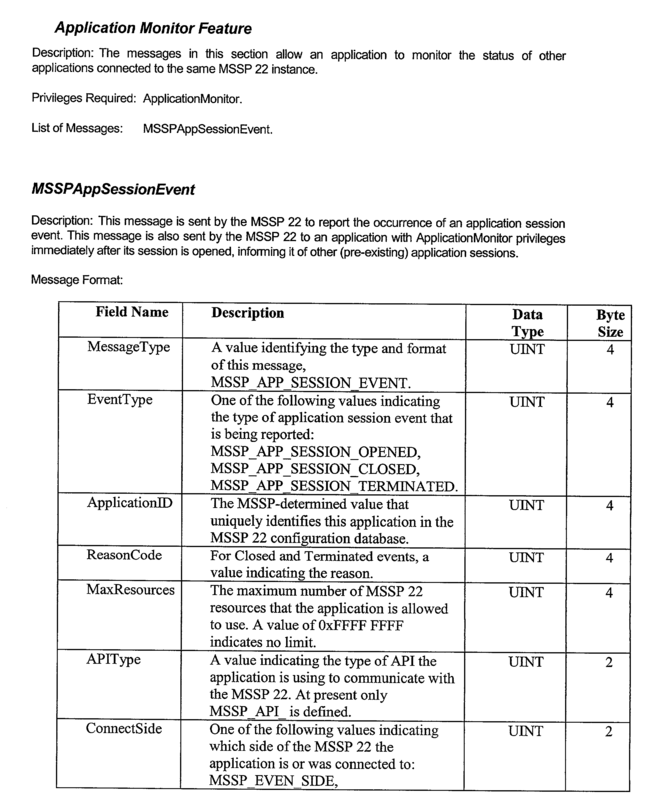 The MSSP server 22 authenticates the application's credentials. 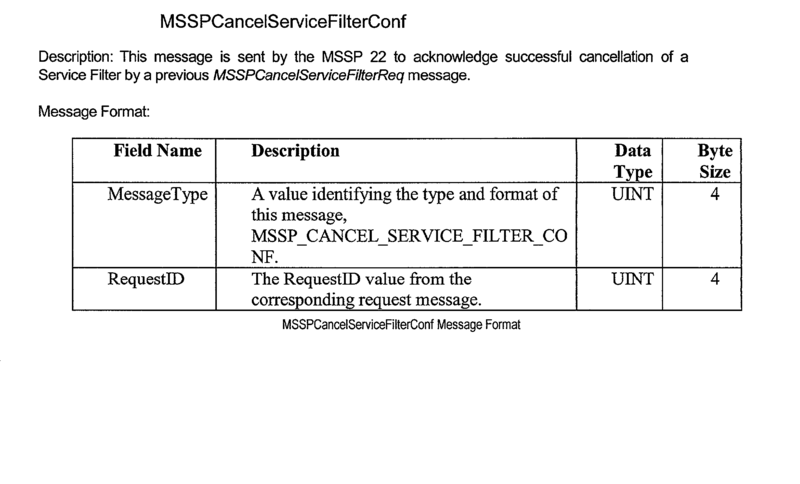 A session open confirmation is received from the MSSP server 22. The stage 52 initializes (74) an application layer. The initialization (74) includes sending a negotiate API version request and receiving a negotiate API version confirmation. An open request is sent and confirmed. Referring to FIG. 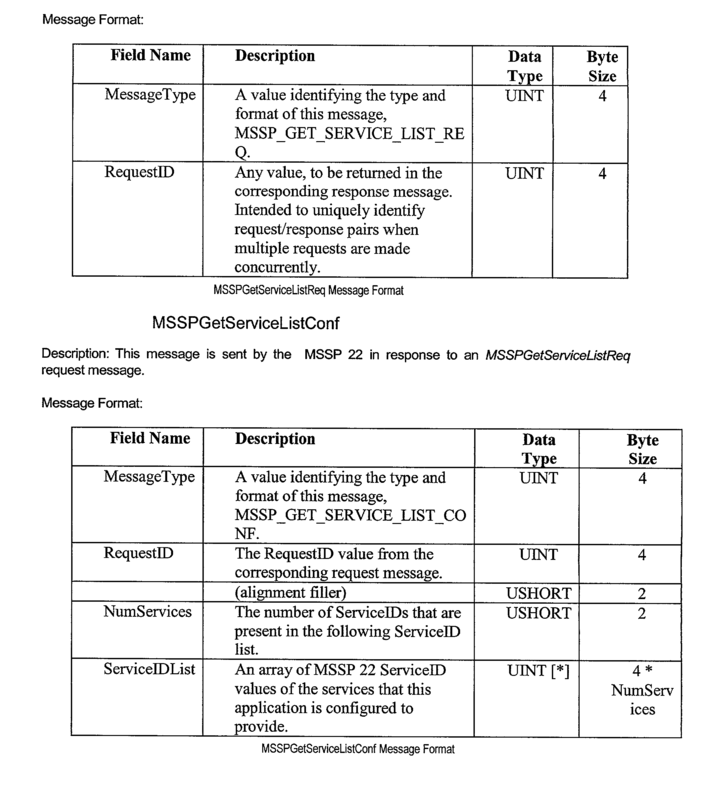 4, the service initialization stage  54 includes sending (80) a get service list request; the MSSP server 22 looks up the services for this application. 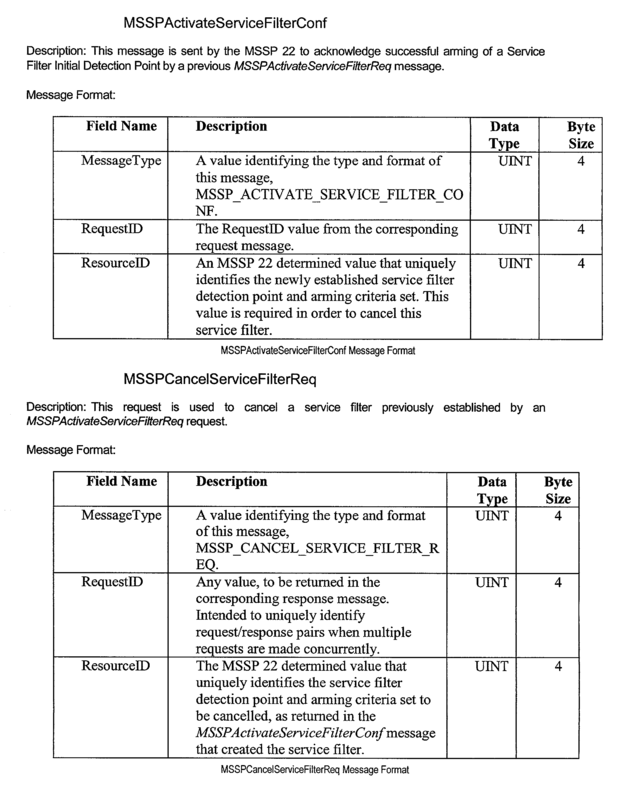 The stage 54 receives (82) a get service list confirmation and sends (84) a get service detail request; the MSSP server 22 looks up configuration data for the service. The stage 54 receives (86) a get service detail request confirmation. Referring to FIG. 5, the service deployment stage  56 includes sending (90) an Arm IDP request and receiving (92) an Arm IDP confirmation. The MSSP server 22 verifies that the arming criteria meets any restrictions configured for the application and service and programs the ICP criteria into the MSSP server 22. Referring to FIG. 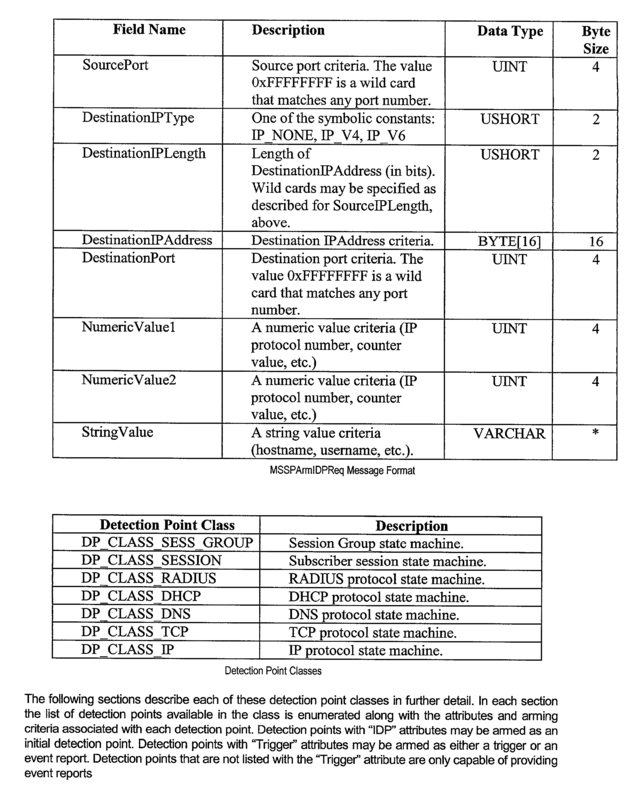 6, the service logic stage  58 includes receiving (100) an initial DP event. The stage 58 determines (102) a new destination for the subscriber connection and sends (104) a connect request to the new destination. The stage 58 receives (106) a connect confirmation. Referring to FIG. 7, the shutdown stage  60 includes sending (110) a disarm IDP request and receiving (112) a disarm IDP confirmation. The stage 60 sends (114) a close request and receives (116) a close confirmation. The stage 60 sends (118) a session close request, receives (120) a session close confirmation, and closes (122) the TCP/IP socket. Referring to FIG. 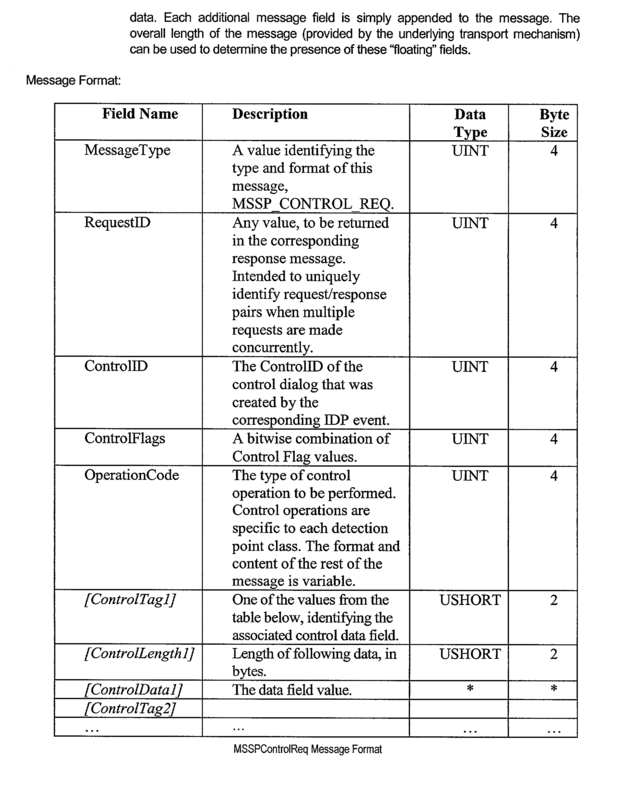 8, a table  130 shows a set of data types utilized to define fields within messages used by the API 28. The table 130 includes a data type name 132, a definition 134, and a byte size 136. CHAR[n] refers to a UTF-8 character string. UTF-8 is a character encoding scheme in which the entire set of ASCII characters are encoded in one byte with the same encoding as ASCII while also allowing any of the full range of Unicode characters to be encoded using multiple-byte sequences in which no byte contains an ASCII character value. Referring to FIG. 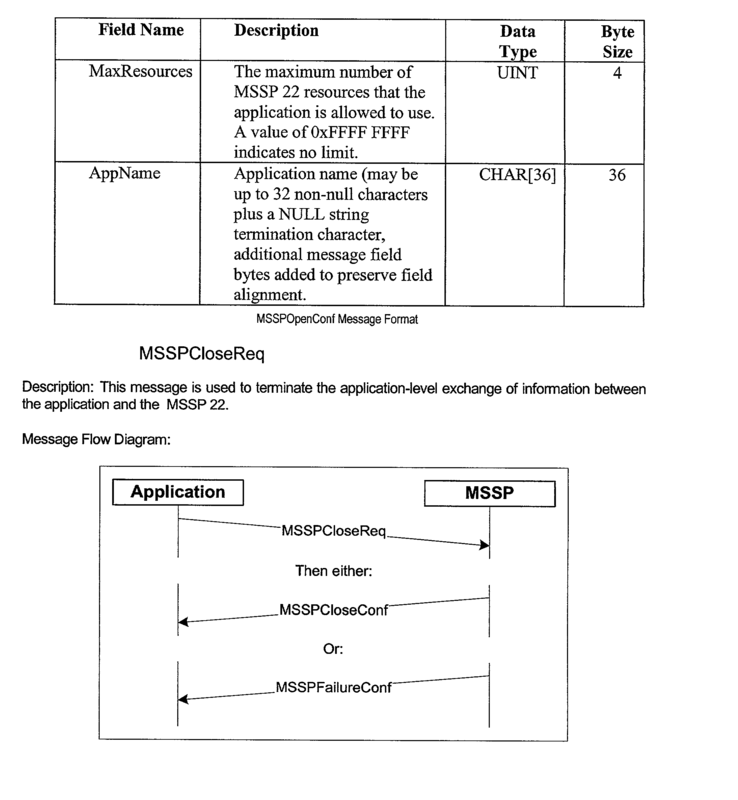 9, a communication path  140 (indicated by the arrows) between an application program 30 and the MSSP server 22 uses a layered architecture. The application program 30 transmits data through its system's application layer 142, presentation layer 144, session layer 146, transport layer 148, TCP/IP layer 150 and lower layers 152, to corresponding lowers layers 154, TCP/IP layer 156, transport layer 158, session layer 160, presentation layer 162 and application layer 164 of the MSSP SERVER 22. The transport layer  158 is used to provide a reliable transport to the session layer 160. The transport layer 158 is relatively lightweight since it is layered on top of the local TCP/IP layer 156, which by definition is reliable. The transport layer 158 receives messages from the session layer 160 that are then transmitted. The transport layer 158 separates the byte stream provided by the TCP/IP layer 156 into messages that are framed by a transport header. The API  28 uses an 8-byte transport message header as the first element in a message. 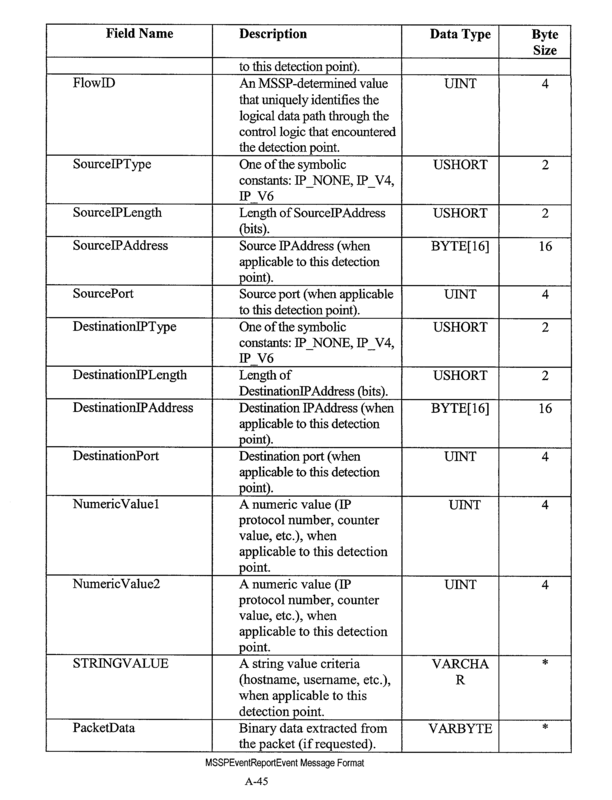 The 8-byte transport message header includes a 4-byte INIT “framemarker” field that is a constant value used to verify the presence of a valid transport message header. Any other value is indicative of a message framing error. 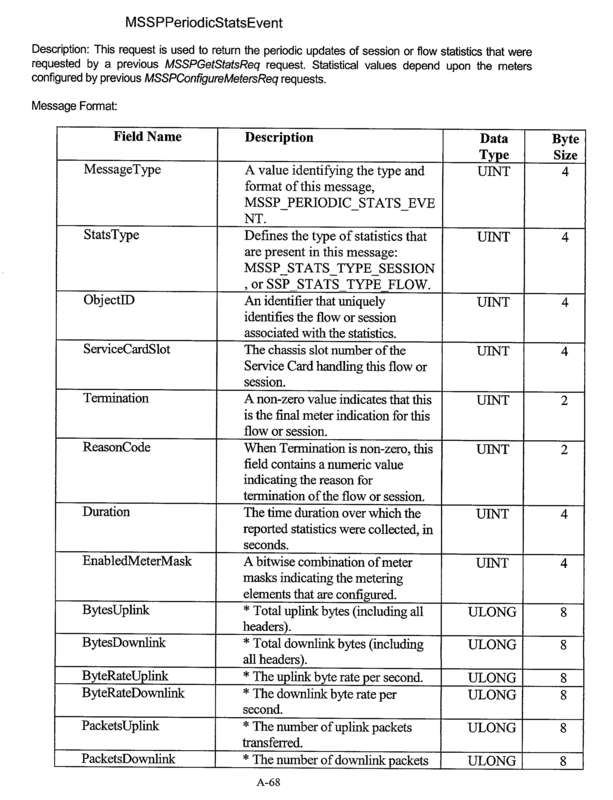 The 8-byte transport message header also includes a 4-byte “messagelength” field and contains an UNIT data type representing the length, in bytes, of the message data that follows. The API  28 utilizes session level interfaces built on top of the reliable TCP/IP transport layer that guarantees a message will arrive. This session layer provides a set of session level services to the application layer. These services include authentication, session level heartbeats, and session level acknowledgements. A client and server exchange credentials during a session establishment sequence. The client provides an encrypted Session Security Descriptor that is the MD5 message-digest of the SessOpenReq message (excluding the SessionSecurityDescriptor field) encrypted using a private key of a public/private key pair. 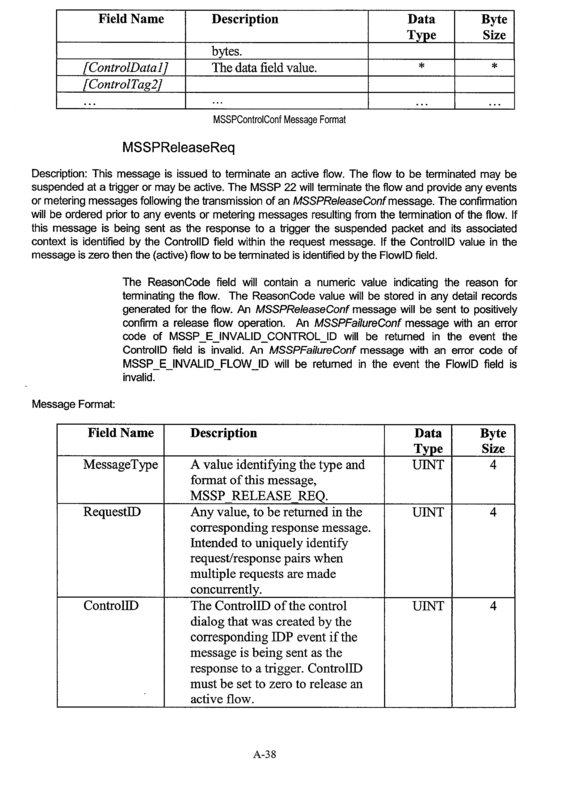 The MD5 message format is designed by RSA Data Security, Inc. and defined in IETF RFC 1321 (see www.ietf.org). Since a given application will likely open its session the same way every time, a random number field is provided in the message in order to prevent generating a “constant” message digest value and a resulting predictable Session Security Descriptor. 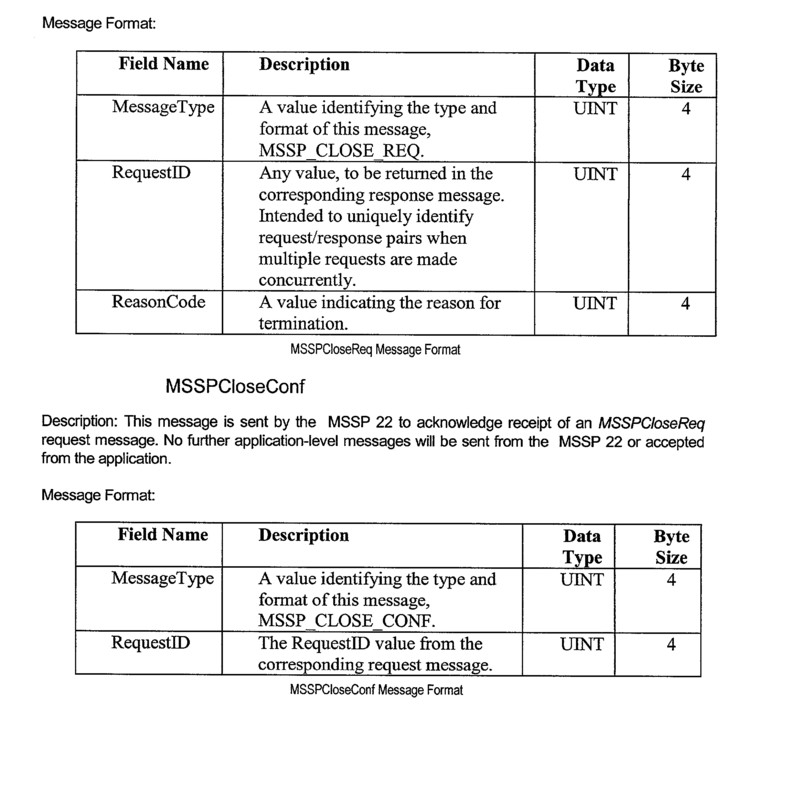 The MSSP server  22 configuration of the application contains the public key of the public/private key pair. 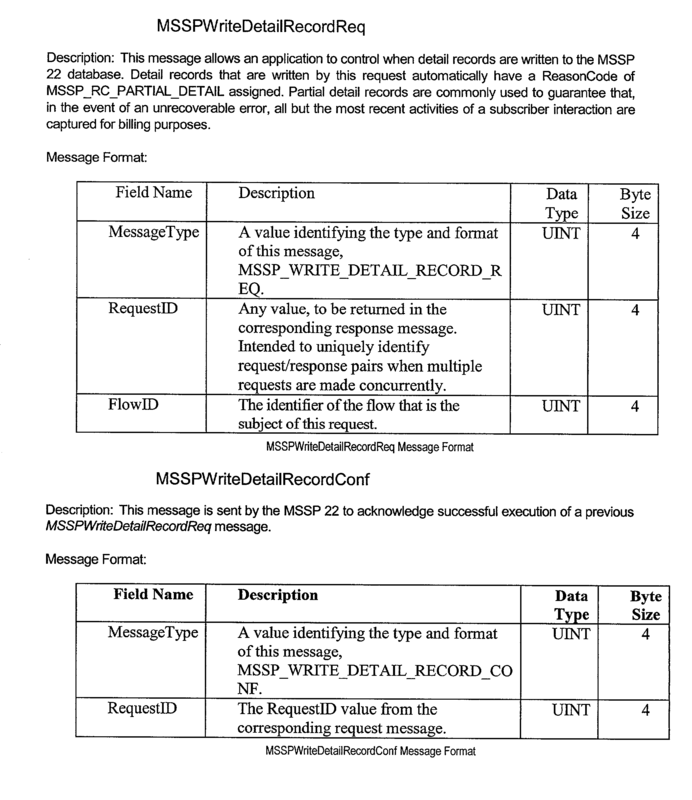 Upon receipt of the security descriptor in a SessOpenReq message, the server looks up the application in the MSSP server 22 configuration to obtain the client's public key, decrypt the given security descriptor using the public key, and verify that the decrypted result exactly matches the MD5 message-digest generated from the received message. If the credentials fail to validate, the server responds with a SessError message with an error code of MSSP_E_AUTH_FAILURE. If a number of successive failures occur in a unit amount of time, the server suspends listening for connection requests for a period of time not less than one minute. An 8-byte SessionHeader field that is a session header with a SessionMessage Type equal to Sess_Open_Req. A 4-byte UNIT SessionVersion field that represents a session protocol version supported by the client. A 4-byte UNIT SessionOptionsMask field that represents a bitwise combination of all the session layer options supported by the client. A 4-byte UNIT SessionHeartbeatInterval field that represents the nominal interval between exchanges of session heartbeat messages in seconds. 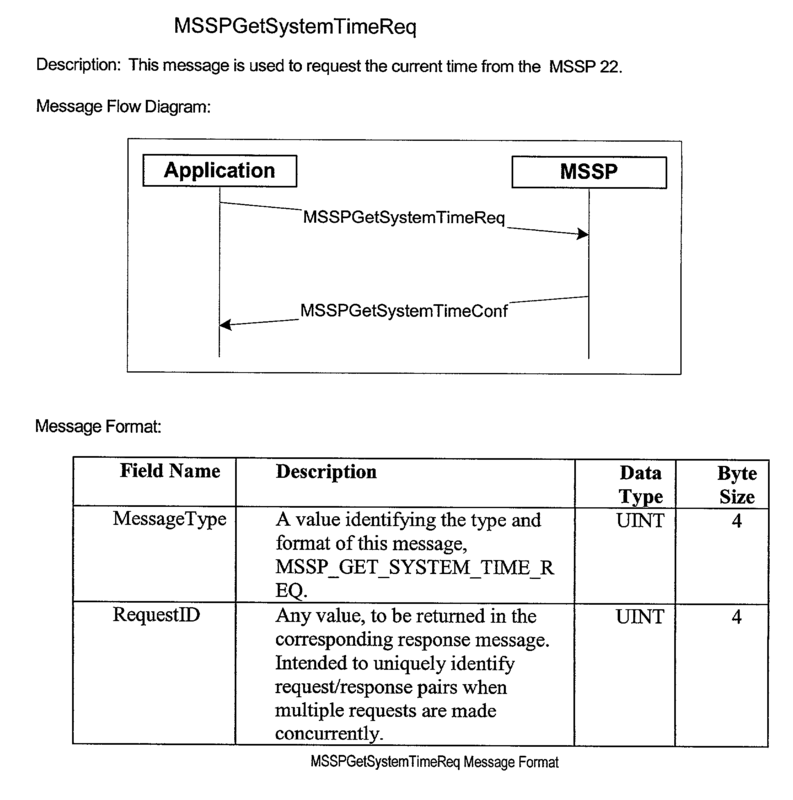 A 4-byte UINT SessionApplicationID field that represents a MSSP server  22 determined value uniquely identifying this client application in the MSSP server 22. A 4-byte UNIT SessionRandonNum field represents any unpredictable value and is used to prevent predictable SessionSecurityDescriptor. A 16-byte BYTE SessionSecurityDescriptor field representing a session security descriptor that is a MD5 message-digest of the message (excluding this field) encrypted using the client's private key of a public/private key pair. The server decrypts the session security descriptor using its copy of the client's public key to authenticate the client. 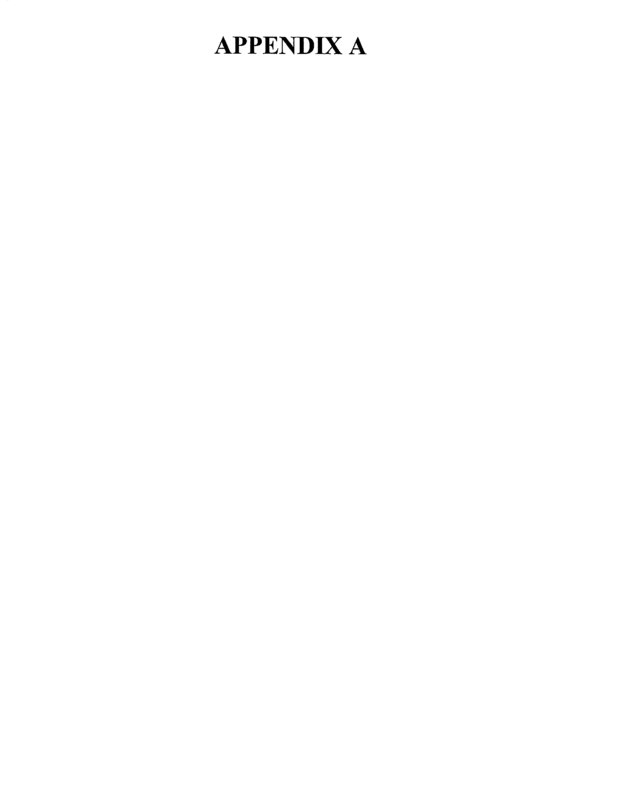 An 8-byte SessionHeader field representing a session header with SessionMessageType SESS_OPEN_CONF. A 4-byte UINT SessionVersion field represents a session protocol version chosen for use by the server. A 4-byte UNIT SessionOptionsMask field representing a bitwise combination of all of the client session layer options chosen by the server. A 4-byte UNIT SessionHeartbeatInterval field representing a nominal interval between exchanges of session heartbeat messages in seconds. 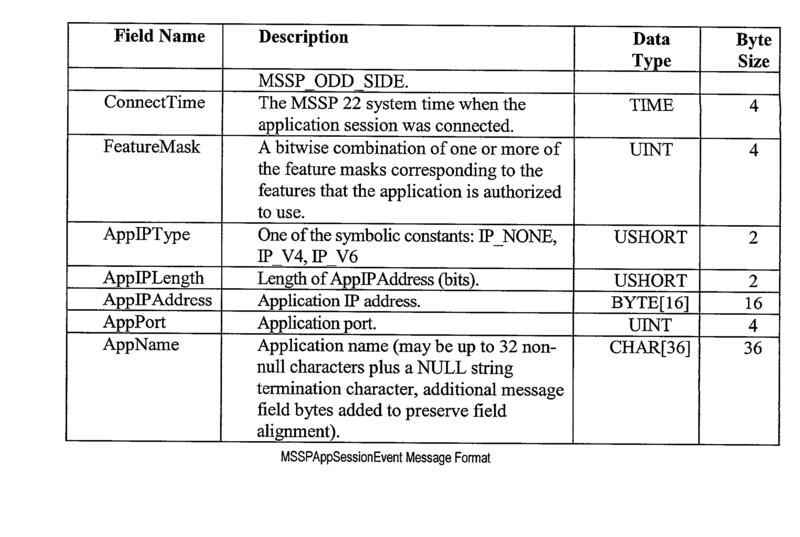 A 4-byte UNIT SessionServerID field represents a value uniquely identifying this MSSP SERVER  22 instance. A 4-byte UNIT SessionRandonNum field represents any unpredictable value and is used to prevent predictable SessionS ecurityDescriptor. A 16-byte BYTE SessionSecurityDescriptor field representing a session security descriptor that is the MD5 message-digest of the message (excluding this field) encrypted using the server's private key of a public/private key pair. The client should decrypt the session security descriptor using its copy of the server's public key to authenticate the server. Referring to FIG. 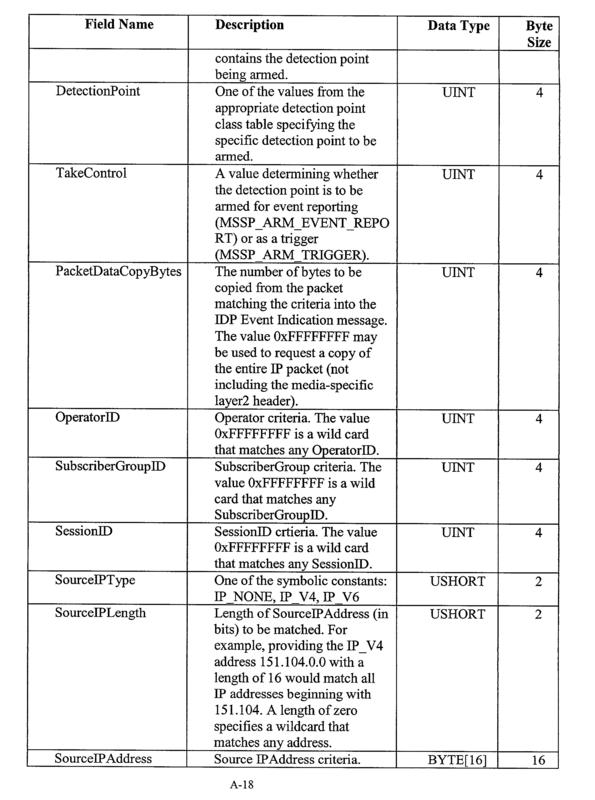 11, a table  170 containing sample error codes is shown. 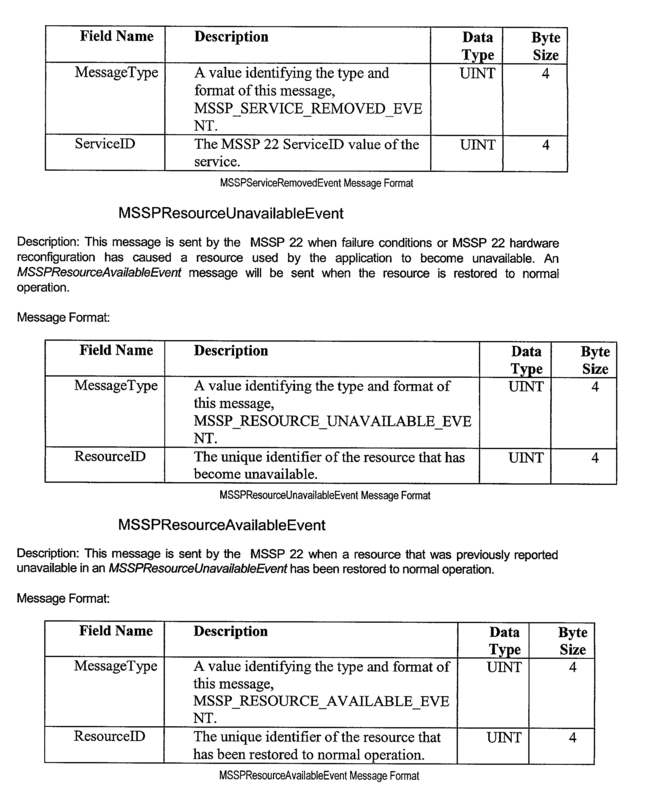 Capabilities of the MSSP server  22 may be grouped into feature categories. When applications 30 open their session with the MSSP server 22 the applications 30 specify what features they want through the API 28. 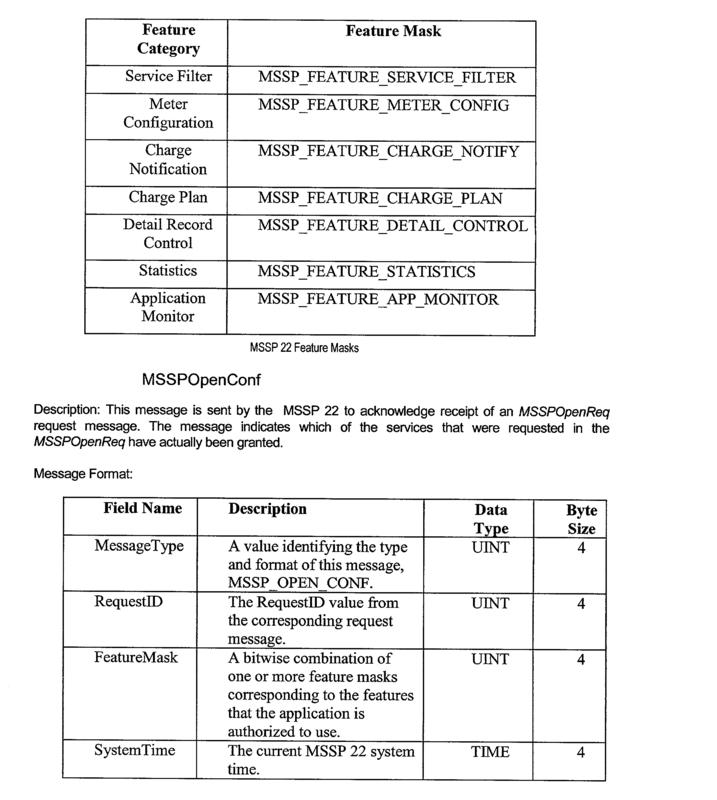 Each MSSP feature has a corresponding privilege bit. 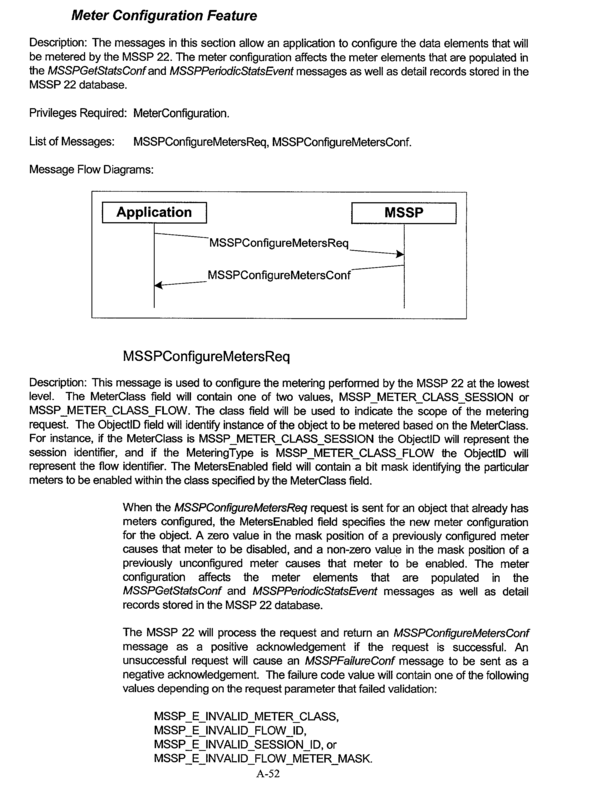 A configuration entry in a MSSP configuration database 32 residing in a MSSP storage device 34 for an application contains a set of feature privileges that control what features the application 30 is authorized to use. Only the requested features that are authorized for the application 30 are granted, and the application 30 is informed of the features that have successfully been obtained in the response to the request. 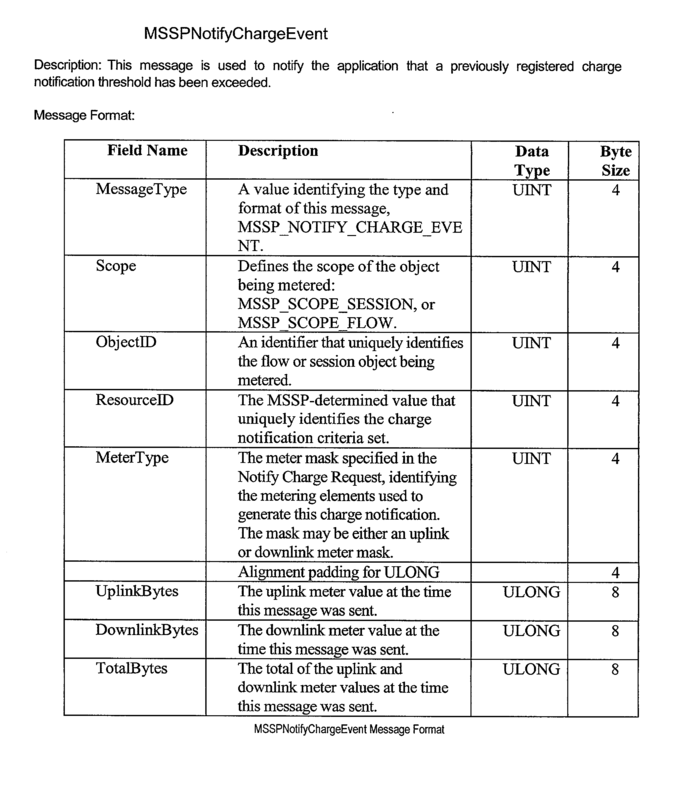 Application attempts to use messages in a feature category that it has not been granted are refused with a privilege error. Referring to FIG. 12, a table  180 listing feature categories is shown. Feature categories include a common services feature category 182, an Initial Detection Point feature category 184, an Event Reporting feature category 186, a Service Filter feature category 188, a Meter Configuration feature category 190, a Charge Notification feature category 192, a Charge Plane feature category 194, a Detail Record Control feature, category 196. a Statistics feature category 198, and an Application Monitor feature category 200. Messages associated with each of the feature categories 182-200, with their respective format, are listed in Appendix A, and incorporated herein by reference. 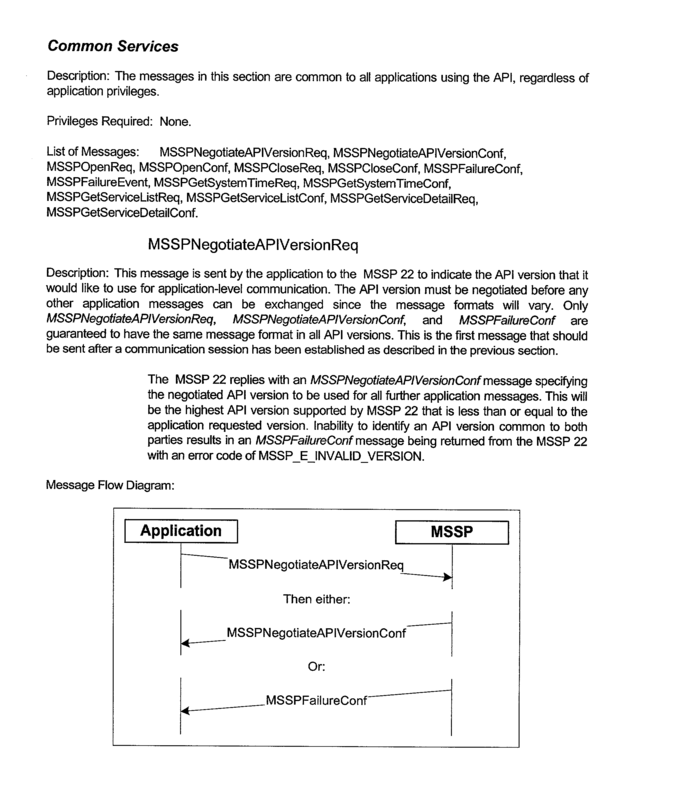 passing the messages from the API to a control process in a mobile service switching platform (MSSP). 2. The method of claim 1 in which the network is a wireless network. 3. The method of claim 2 in which the wireless network is a second generation wireless network. 4. The method of claim 2 in which the wireless network is a GSM network. 5. The method of claim 2 in which the wireless network is a GPRS-enabled GSM network. 6. The method of claim 2 in which the wireless network is a TDMA network. 7. The method of claim 2 in which the wireless network is a CDMA network. 8. 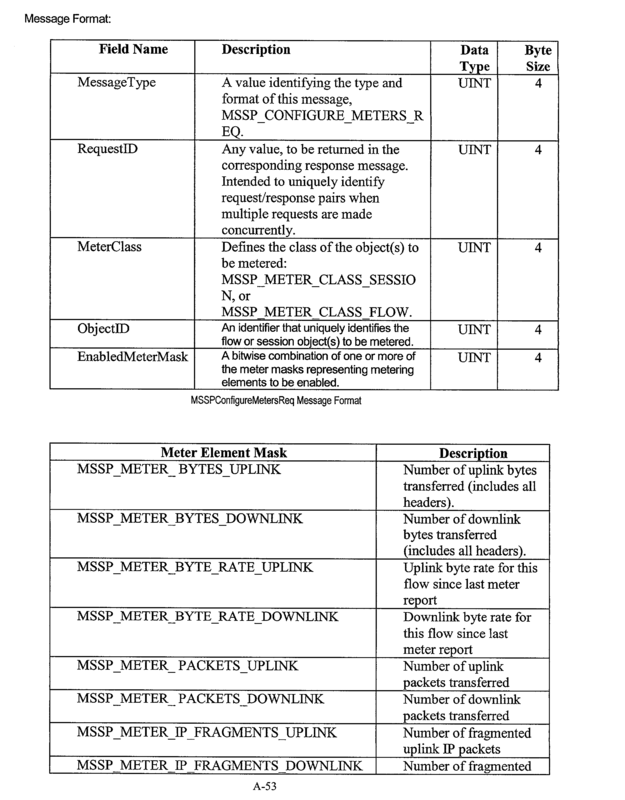 The method of claim 2 in which the wireless network is a UMTS network. 9. The method of claim 2 in which the wireless network is a TETRA network. 10. The method of claim 2 in which the wireless network is a Tetrapol network. 11. The method of claim 2 in which the wireless network is a DECT network. 12. The method of claim 2 in which the wireless network is an AMPS network. 13. The method of claim 2 in which the wireless network is a WLAN. 14. The method of claim 2 in which the wireless network is a third generation wireless network. 15. The method of claim 1 in which the API provides a protocol that allows the application program to control switching and rounting functions in the MS SP. 16. The method of claim 1 in which the API provides a protocol that allows the application program to redirect packet flow through the MSSP on a per-flow basis. 17. The method of claim 1 in which the API provides a protocol that allows the application program to control policy decisions within the MSSP. 18. The method of claim 1 in which the API provides a protocol that allows the application program to arm initial detection points (IDPs) and services associated IDP events in the control process. 19. 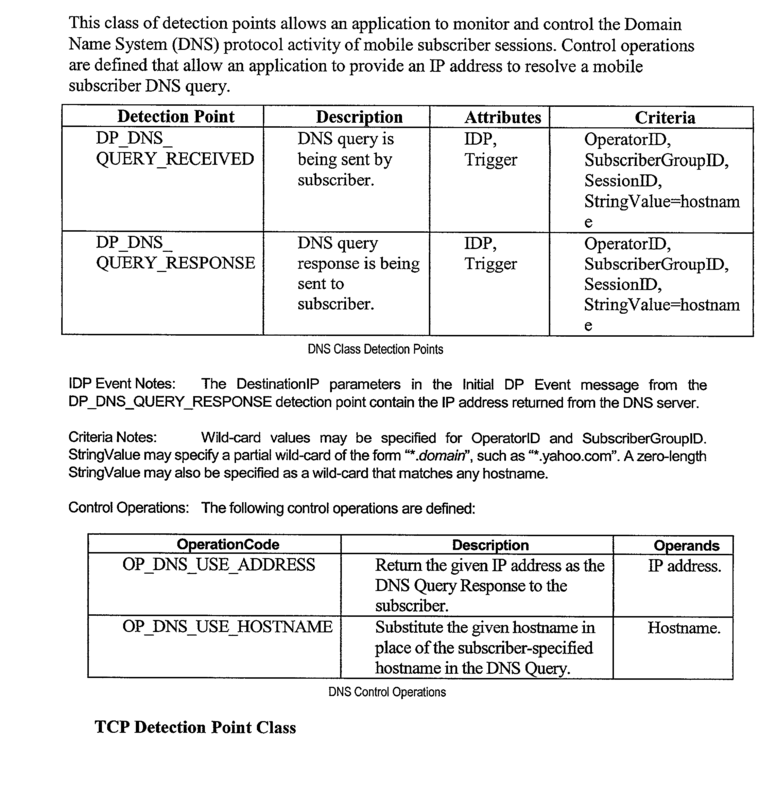 The method of claim 1 in which the API provides a protocol that allows the application program to disarm IDPs and service associated ICP events in the control process. 20. 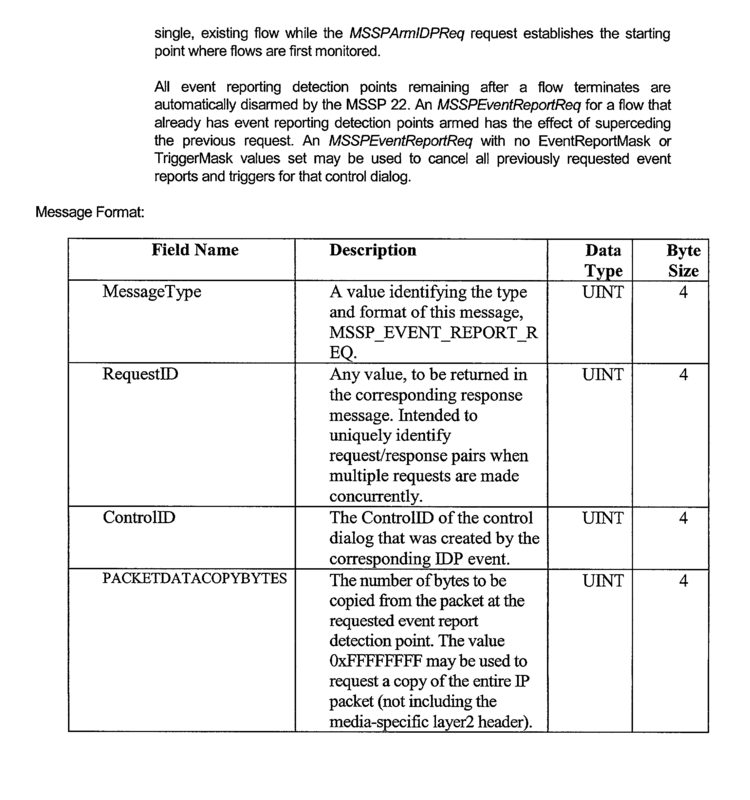 The method of claim 1 in which the API provides a protocol that allows the application program to request event reports. 21. 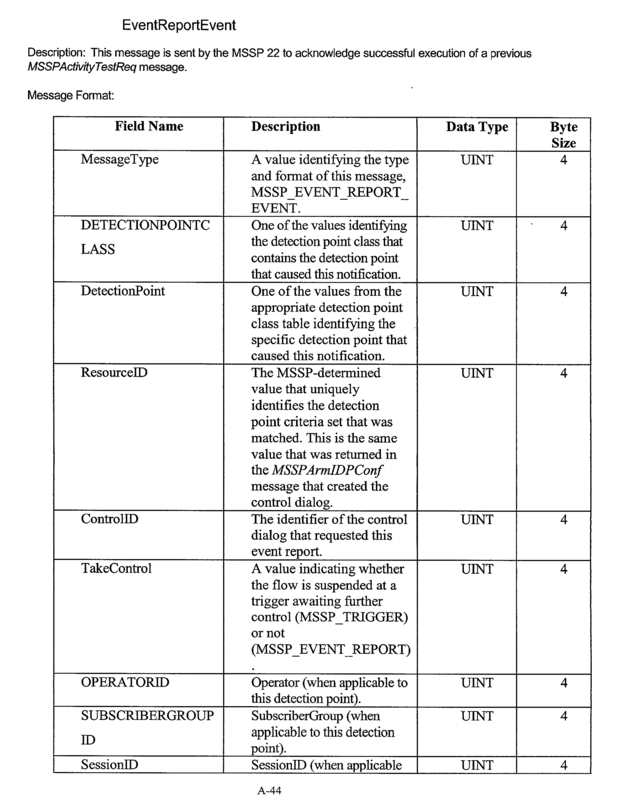 The method of claim 1 in which the API provides a protocol that allows the application program to specify programmed behavior at a detection point in the control process. 22. 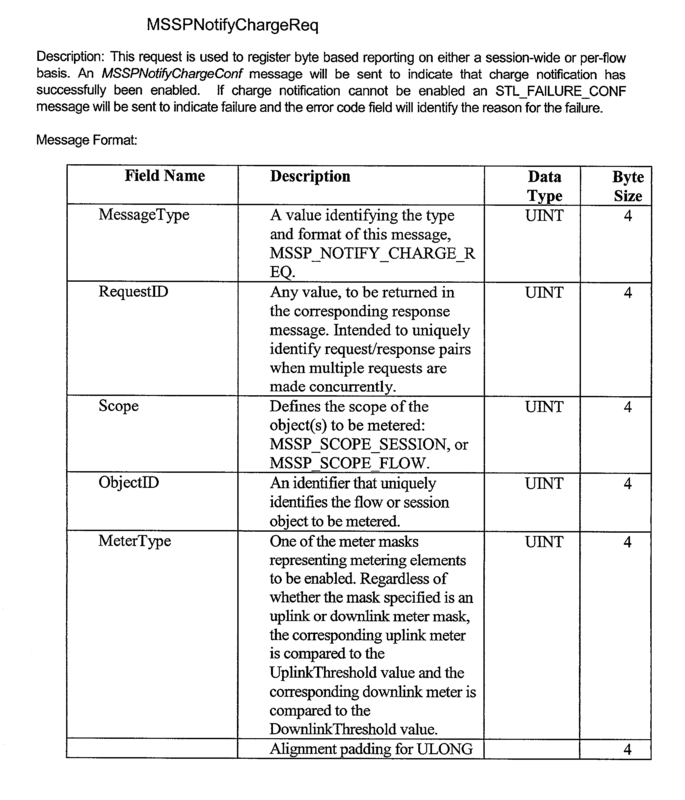 The method of claim 1 in which the API provides a protocol that allows the application program to configure data elements that are metered by the control process of the MSSP. 23. The method of claim 1 in which the API provides a protocol that allows the application program to request byte-based reporting. 24. The method of claim 23 in which the reporting is session-based. 25. The method of claim 23 in which the reporting is service interaction based. 26. The method of claim 23 in which the reporting if flow-based. 27. The method of claim 1 in which the API provides a protocol that allows the application program to specify a cost of services provided. 28. 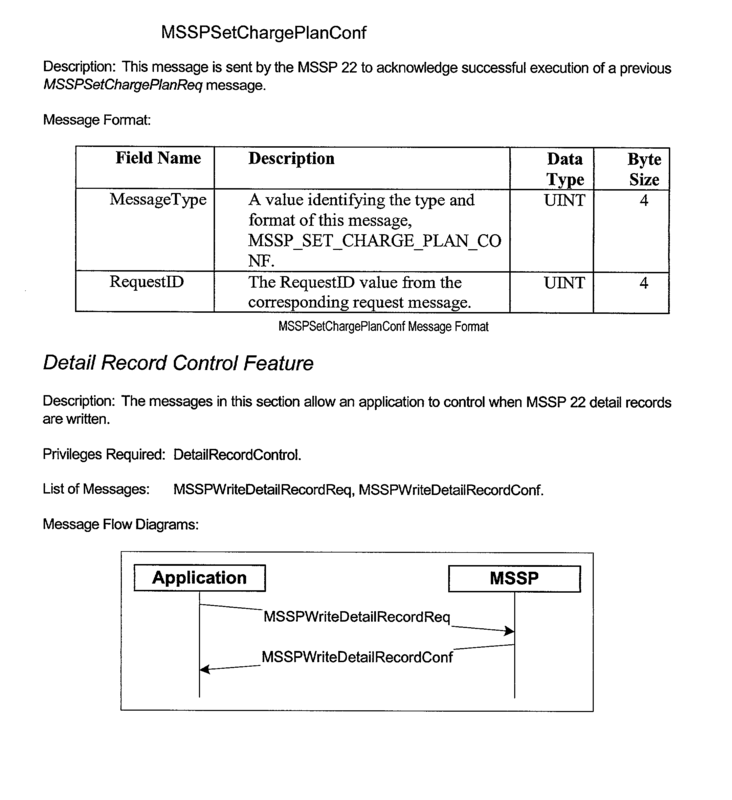 The method of claim 27 in which the protocol allows the application program to record a charge plan used in a detail record. 29. The method of claim 28 in which the protocol allows the application program to control when the detail record is written. 30. The method of claim 1 in which the API provides a protocol that allows the application program to obtain statistics for a session managed by the application program. 31. 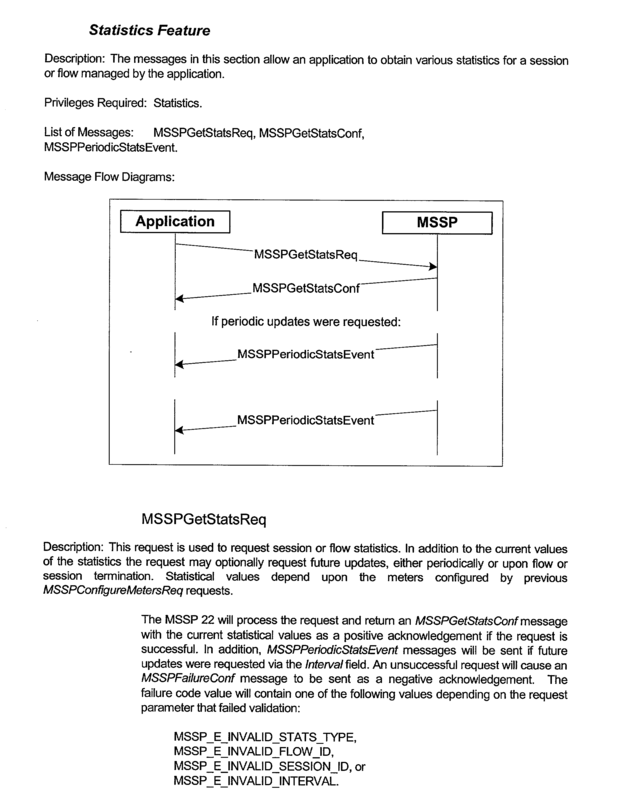 The method of claim 1 in which the API provides a protocol that allows the application program to obtain statistics for a flow managed by the application program. 32. 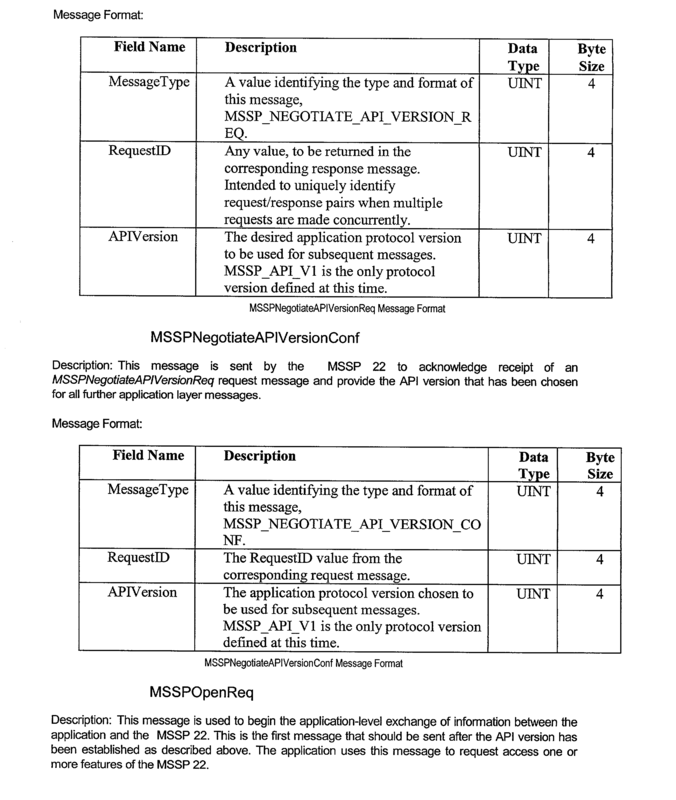 The method of claim 1 in which the API provides a protocol that allows the application program to monitor a status of other applications connected to the control process of the MSSP. a set of application layer protocols that allows exchange of messages between an external application process and a control process residing in a Mobile Service Switching Platform (MSSP) using Transmission Control Protocol/Internet Protocol (TCP/IP) network services. 34. 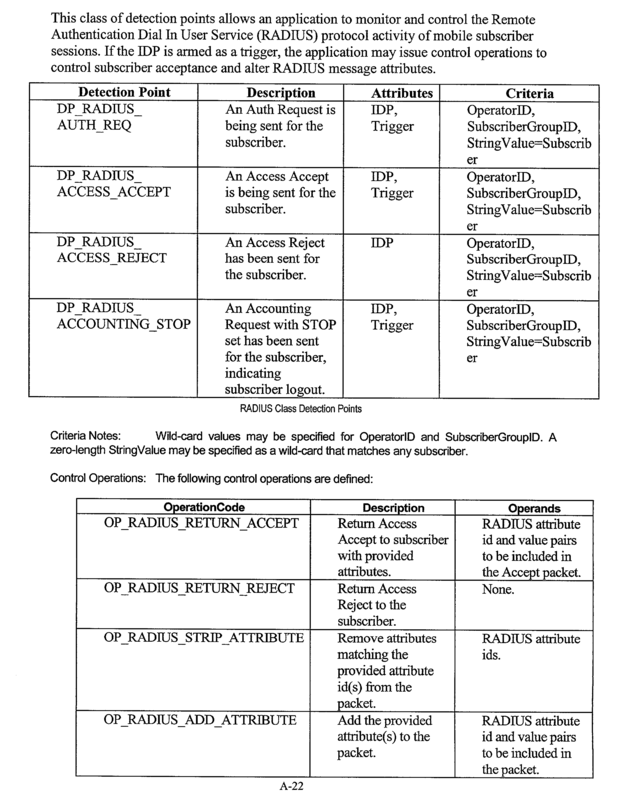 The method of claim 33 in which the set comprises a protocol that allows the application process to control switching and routing functions in the MS SP. 35. 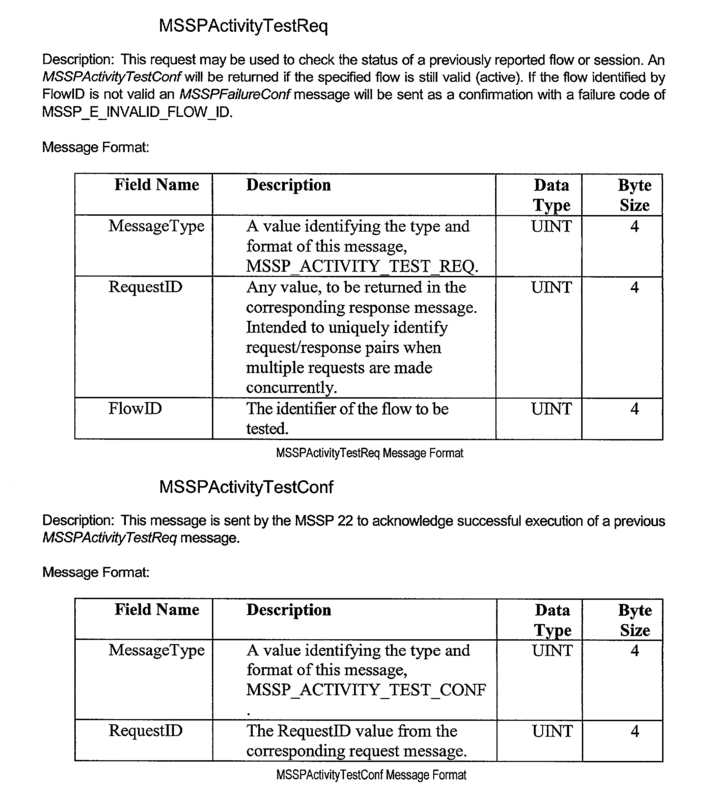 The method of claim 33 in which the set comprises a protocol that allows the application process to redirect packet flow through the MSSP on a per-flow basis. 36. 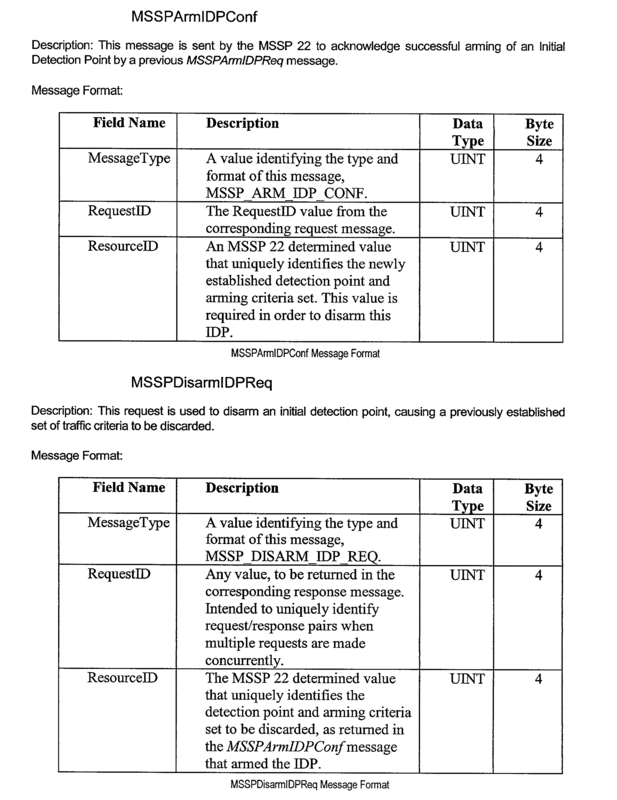 The method of claim 33 in which the set comprises a protocol that allows the application program to control policy decisions within the MSSP. 37. The API of claim 33 in which the set of application layers protocols comprises a protocol that allows the application process to arm initial detection points (IDPs) and services associated IDP events in the control process. 38. The API of claim 33 in which the set of application layers protocols comprises a protocol that allows the application process to disarm initial detection points (IDPs) and services associated IDP events in the control process. 39. The API of claim 33 in which the set of application layers protocols comprises a protocol that allows the application process to request event reports from the control process. 40. The API of claim 33 in which the set of application layers protocols comprises a protocol that allows the application process to specify programmed behavior at a detection point in the control process. 41. The API of claim 33 in which the set of application layers protocols comprises a protocol that allows the application process to configure data elements that are metered by the control process. 42. The API of claim 33 in which the set of application layers protocols comprises a protocol that allows the application process to request byte-based reporting in the control process. 43. The API of claim 42 in which the reporting is session-based. 44. 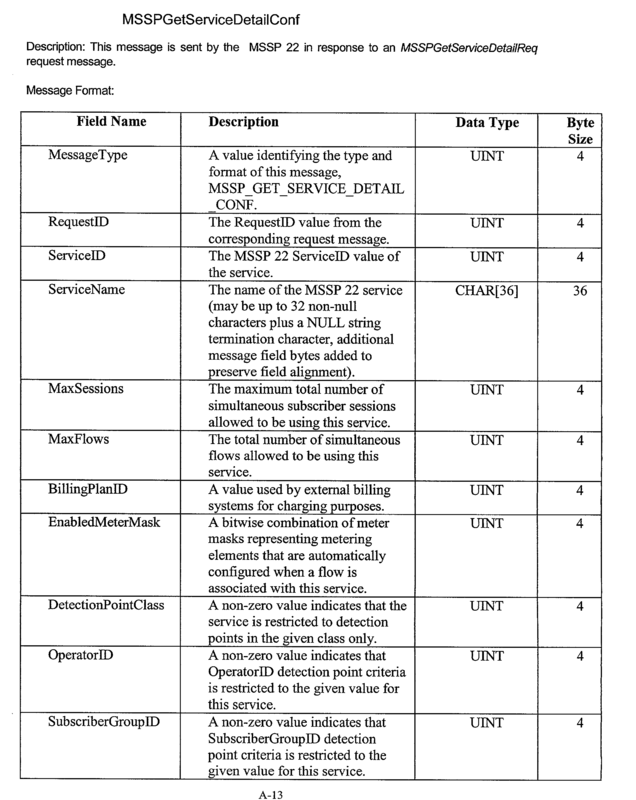 The API of claim 42 in which the reporting is service interaction-based. 45. The API of claim 42 in which the reporting is flow-based. 46. 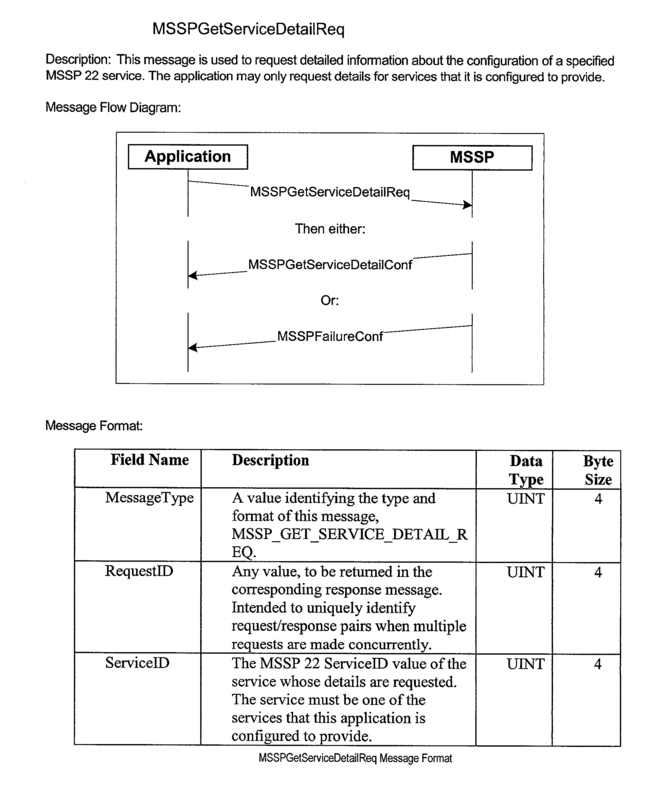 The API of claim 33 in which the set of application layers protocols comprises a protocol that allows the application process to specify a cost of services provided by the MSSP. 47. 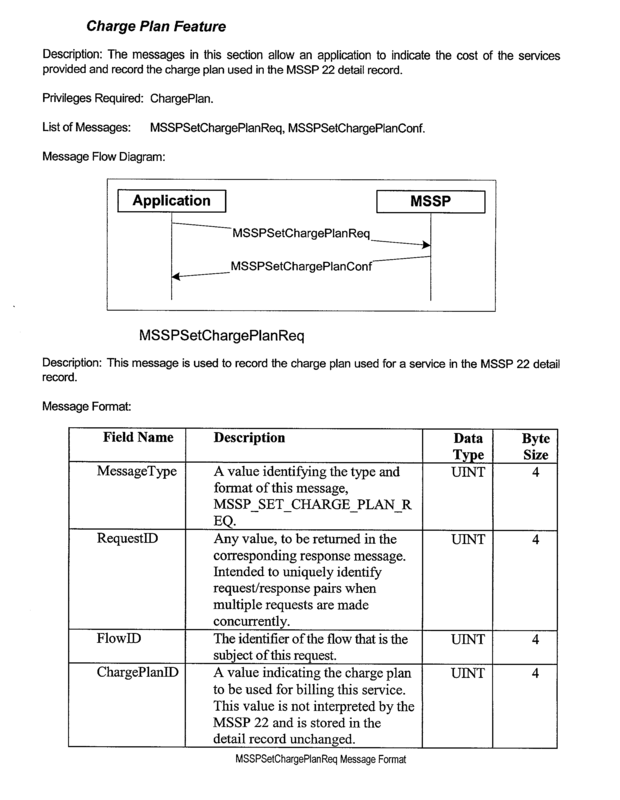 The API of claim 33 in which the set of application layers protocols comprises a protocol that allows the application process to record a charge plan used in a detail record stored in the MSSP. 48. The API of claim 33 in which the set of application layers protocols comprises a protocol that allows the application process to control when the detail record is written. 49. The API of claim 33 in which the set of application layers protocols comprises a protocol that allows the application process to obtain statistics for a session managed by the application process. 50. The API of claim 33 in which the set of application layers protocols comprises a protocol that allows the application process to obtain statistics for a flow managed by the application process. 51. 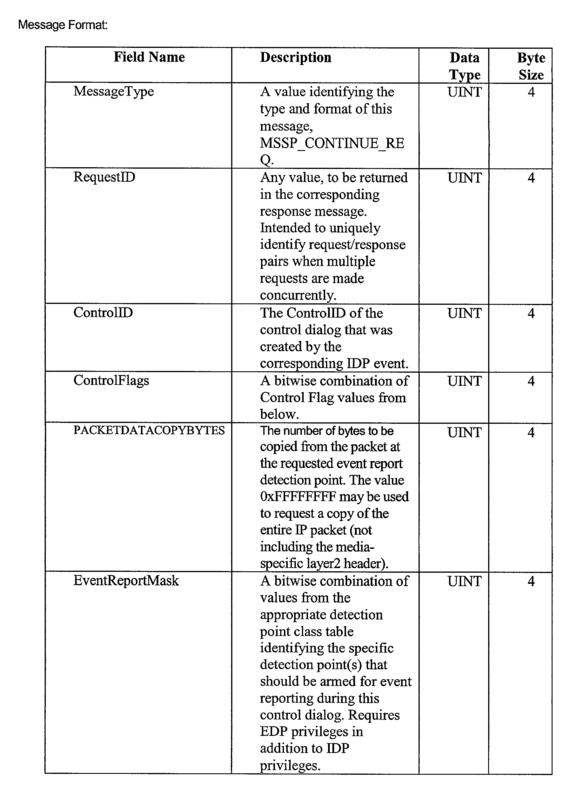 The API of claim 33 in which the set of application layers protocols comprises a protocol that allows the application process to monitor a status of other application processes connected to the control process. an application system executing an application process linked to the API. 53. The system of claim 52 further comprising a General Packet Radio Service Support Node linked to the GGSN. 54. The system of claim 53 further comprising a Base Station Controller (BSC) linked to the General Packet Radio Service Support Node. 55. The system of claim 54 further comprising a Base Transceiver Station (BTS) linked to the BSC. 56. The system of claim 55 further comprising a mobile station (MS) linked to the BTS. 57. The system of claim 52 in which the API comprises a set of application layer protocols that allows exchange of messages between the application process and the control process. 58. The system of claim 57 in which the set of application layers protocols comprises a protocol that allows the application process to arm initial detection points (IDPs) and services associated IDP events in the control process. 59. The system of claim 57 in which the set of application layers protocols comprises a protocol that allows the application process to disarm initial detection points (IDPs) and services associated IDP events in the control process. 60. The system of claim 57 in which the set of application layers protocols comprises a protocol that allows the application process to request event reports from the control process. 61. 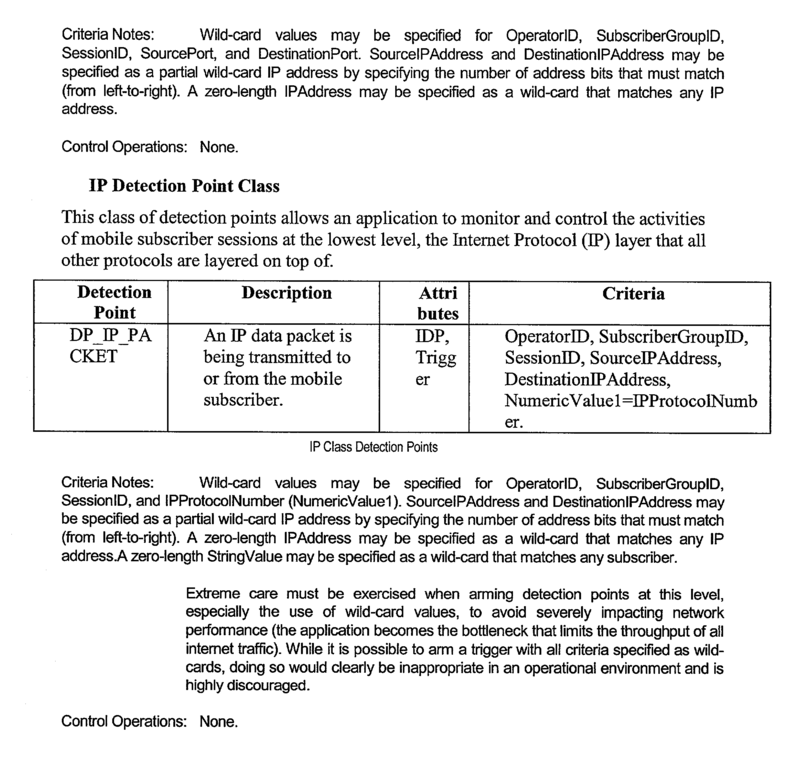 The system of claim 57 in which the set of application layers protocols comprises a protocol that allows the application process to specify programmed behavior at a detection point in the control process. 62. The system of claim 57 in which the set of application layers protocols comprises a protocol that allows the application process to configure data elements that are metered by the control process. 63. The system of claim 57 in which the set of application layers protocols comprises a protocol that allows the application process to request byte-based reporting in the control process. 64. The API of claim 63 in which the reporting is session-based. 65. The API of claim 63 in which the reporting is flow-based. 66. 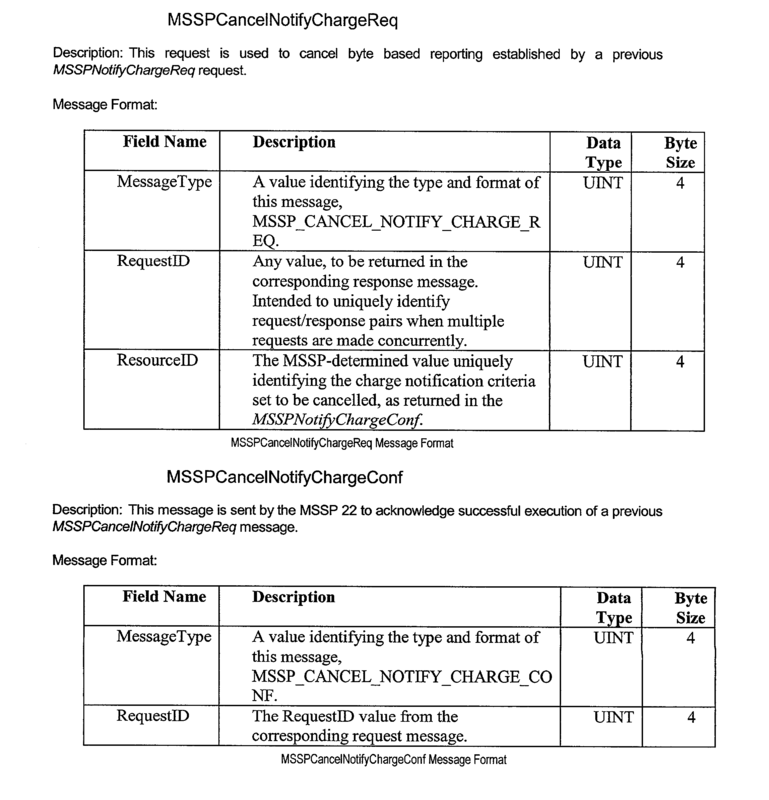 The API of claim 63 in which the reporting is service interaction-based. 67. The system of claim 57 in which the set of application layers protocols comprises a protocol that allows the application process to specify a cost of services provided by the MSSP. 68. 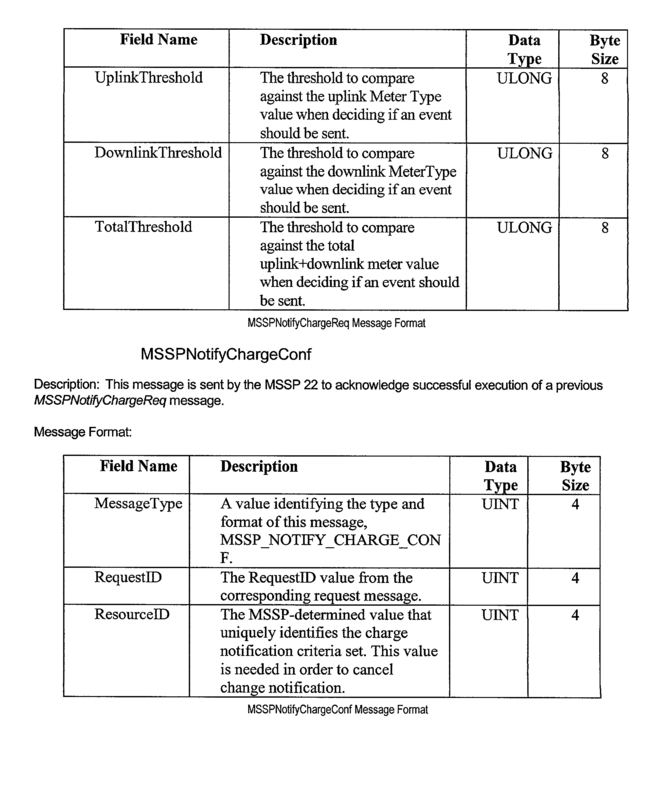 The system of claim 57 in which the set of application layers protocols comprises a protocol that allows the application process to record a charge plan used in a detail record stored in the MSSP. 69. The API of claim 68 in which the set of application layers protocols comprises a protocol that allows the application process to control when the detail record is written. 70. The system of claim 57 in which the set of application layers protocols comprises a protocol that allows the application process to obtain statistics for a session managed by the application process. 71. The system of claim 57 in which the set of application layers protocols comprises a protocol that allows the application process to obtain statistics for a flow managed by the application process. 72. 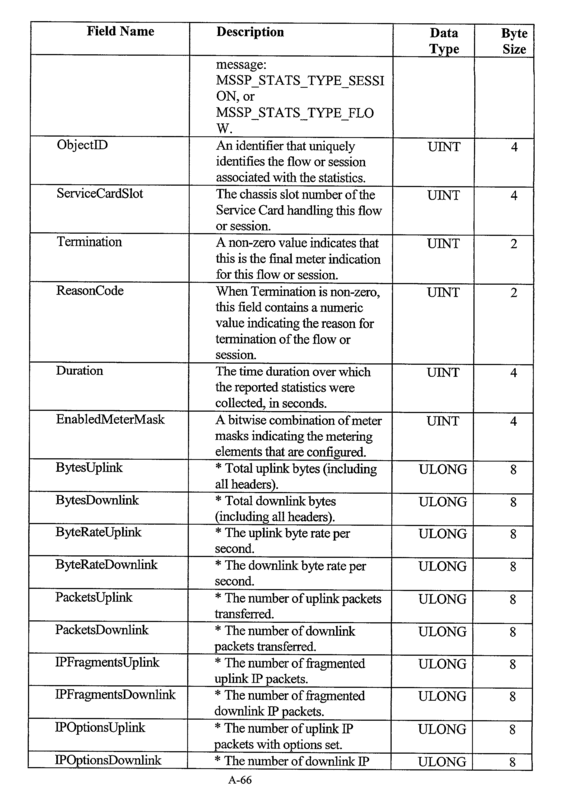 The system of claim 57 in which the set of application layers protocols comprises a protocol that allows the application process to monitor a status of other application processes connected to the control process.